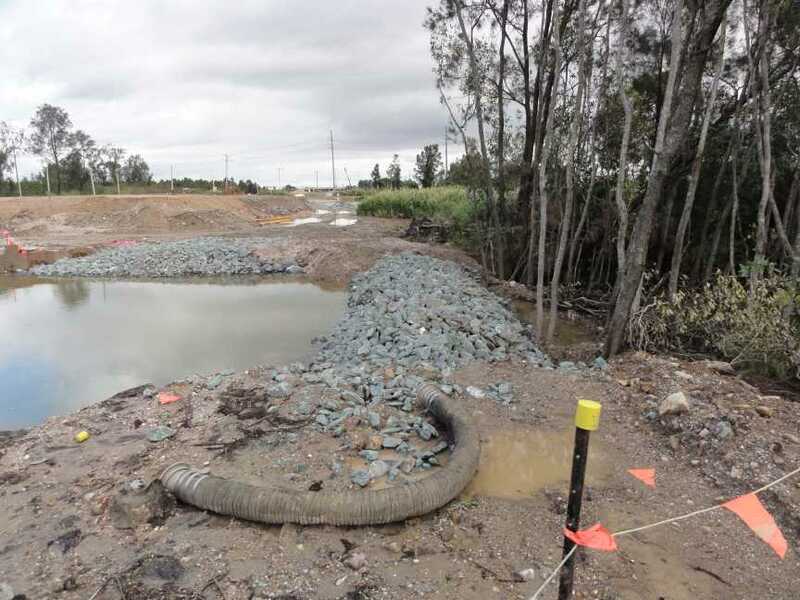 Port of Brisbane Pty Ltd has opened up the blocked drainage channel on the west of Lytton Road to reinstate drainage to the Brisbane River from what is known as Channel 4 and Iona Drain. 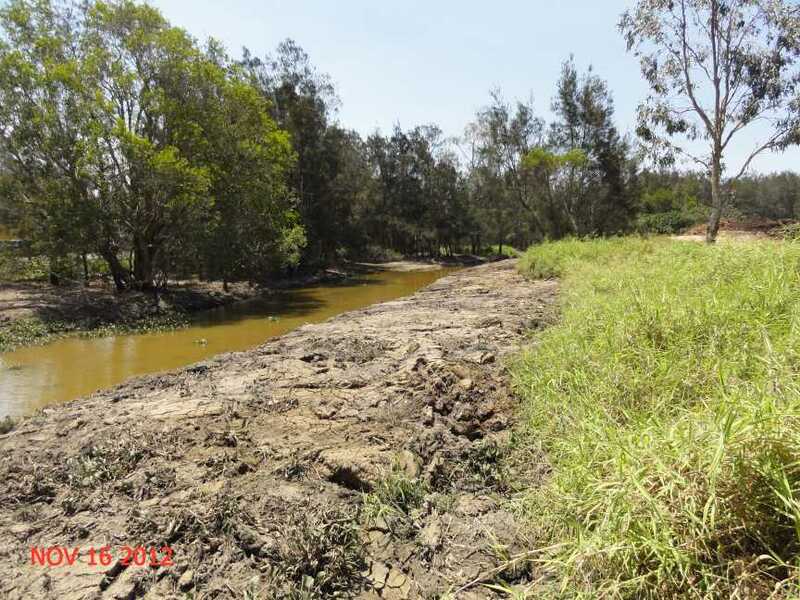 Many Thanks To Port of Brisbane Pty Ltd for undertaking works at their own expense. Queensland Transport & Main Roads should have undertaken this work decades ago or had their Port of Brisbane Corporation do so. 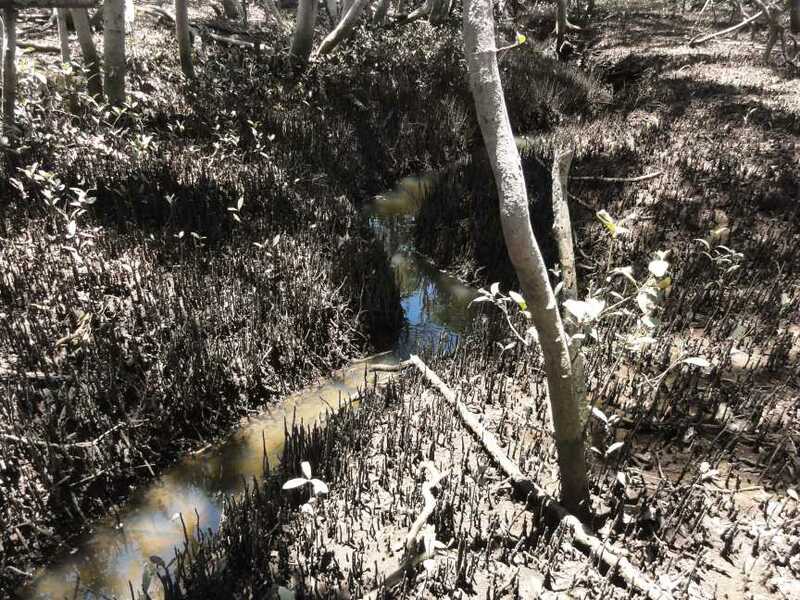 Due to the operations and neglect of the previous Port of Brisbane Corporation and the Department of Harbours and Marine over many decades this important drainage channel had became blocked by years of dredge spoil run off. 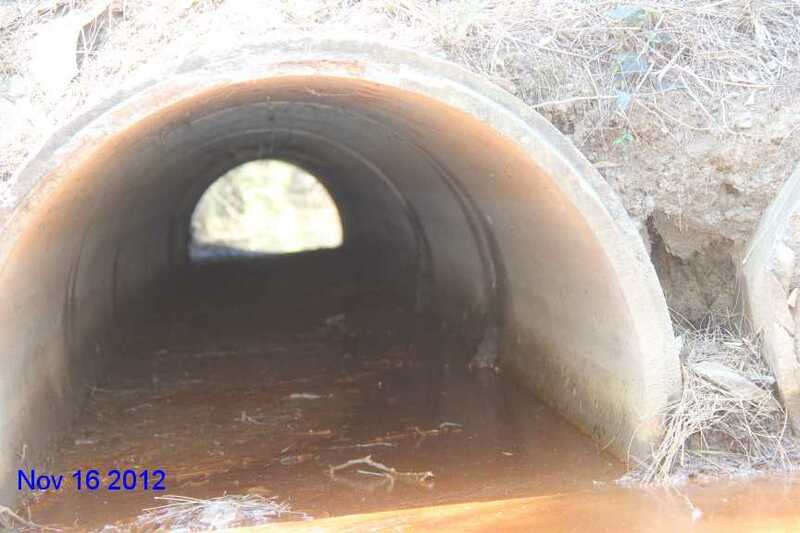 Culverts Lytton Road, Lytton, Channel 4 downstream side. 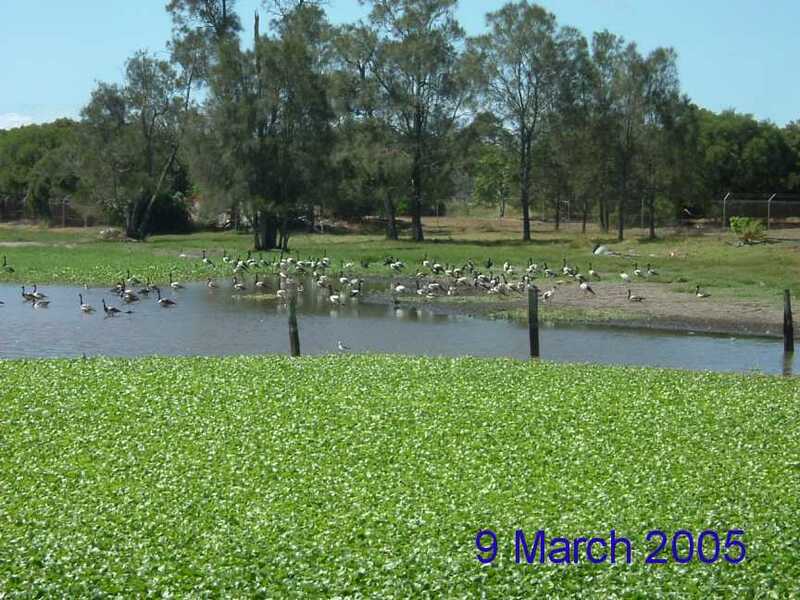 Photo left Aug 2011 right Feb 2013 both at low tide. Notice the difference in tide heights since drainage channel flow restored!! 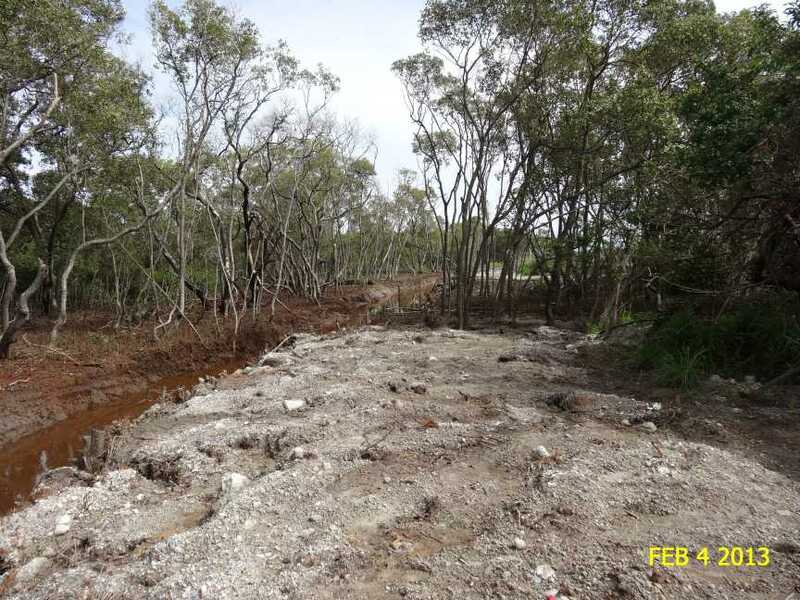 Iona College reports Feb 2013 recent rain fall drained much faster than usual. This engineer's report has been totally ignored for 13 years. 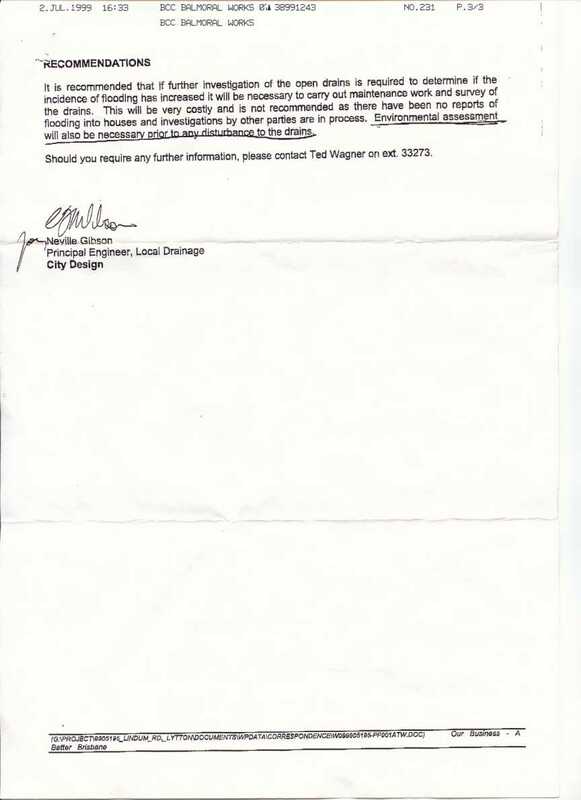 So have residents complaints be ignored as well by ALL. 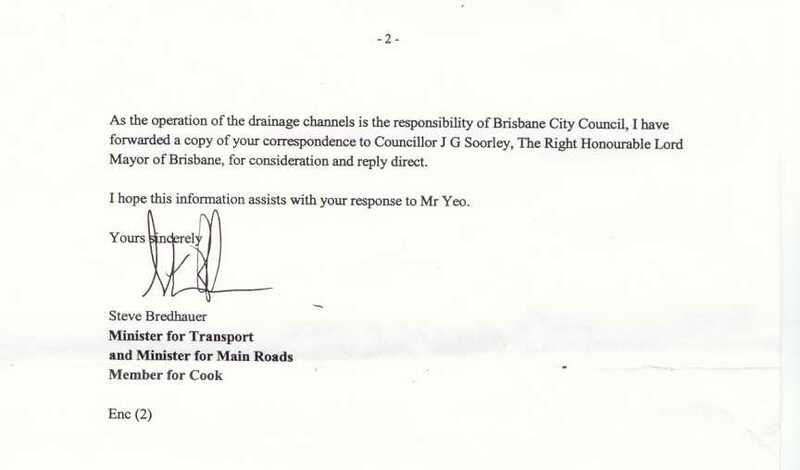 Then in 2012 the BCC send this page to a land owner along Iona Drain. I wonder which set of figures is correct? Maybe this explains the problem. Engineers working from incorrect figures. Why is this local drainage important? 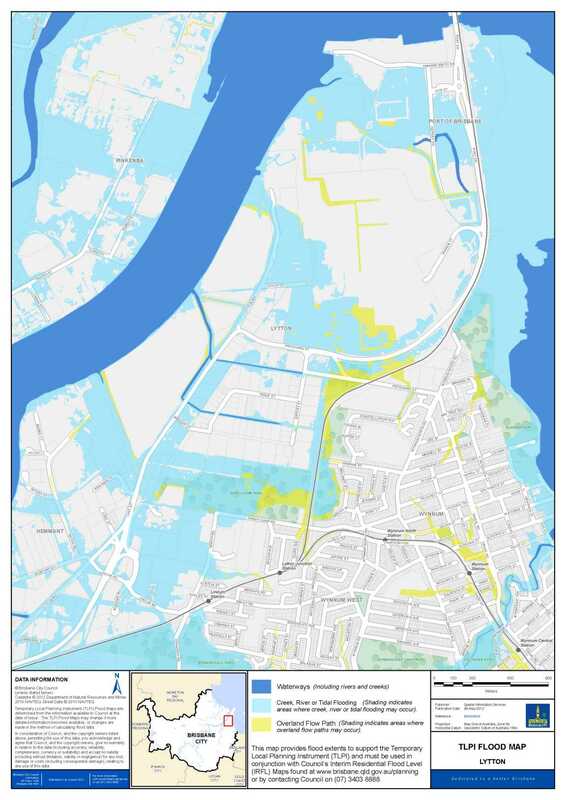 The flooding shown in the photo directly below is a direct result of Port Connect blocking the only drainage channel, Channel 4. Photos of the blocked channel are also below. 29 April 2012 at 146 Lindum Road. Lytton. 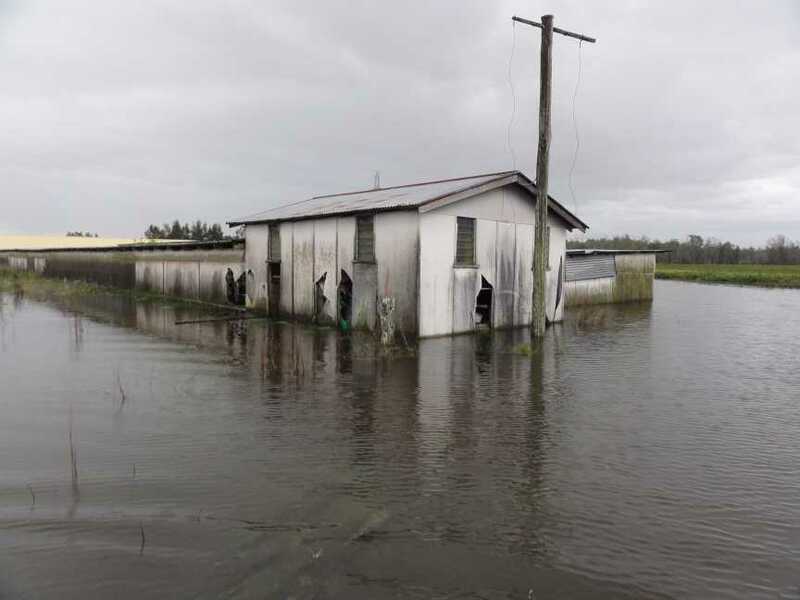 When Len Yeo built these poultry sheds he had already lived at the address since 1941 so he was well aware of the drainage in the area after 40 years living in the area. 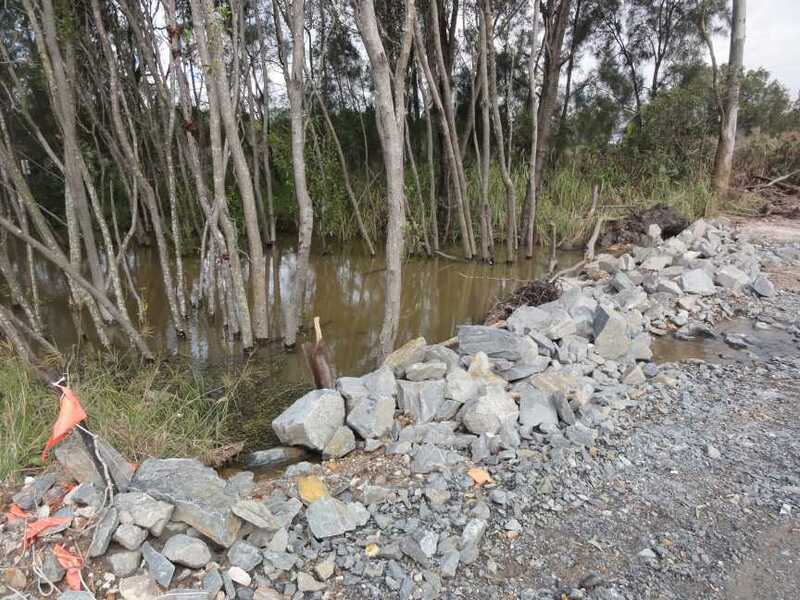 Flooding like this only occurred after the upgrade of Lytton Road which was built about 2 metres higher than the old road but with very limited drainage beneath it all the way from Bulimba Creek at Hemmant to the Ampol Refinery at Lytton. Photo taken late 1960's just after Lytton Road was upgraded. 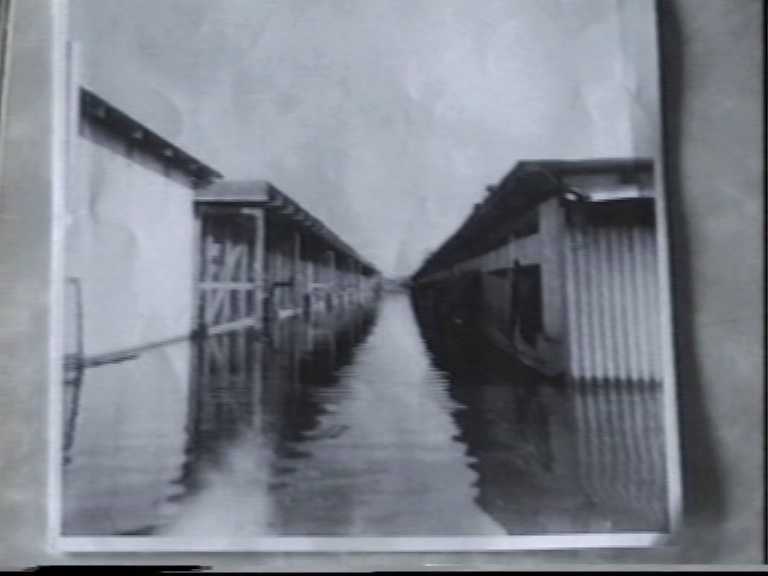 Most of the laying hens were drowned at the flood peak in early morning. 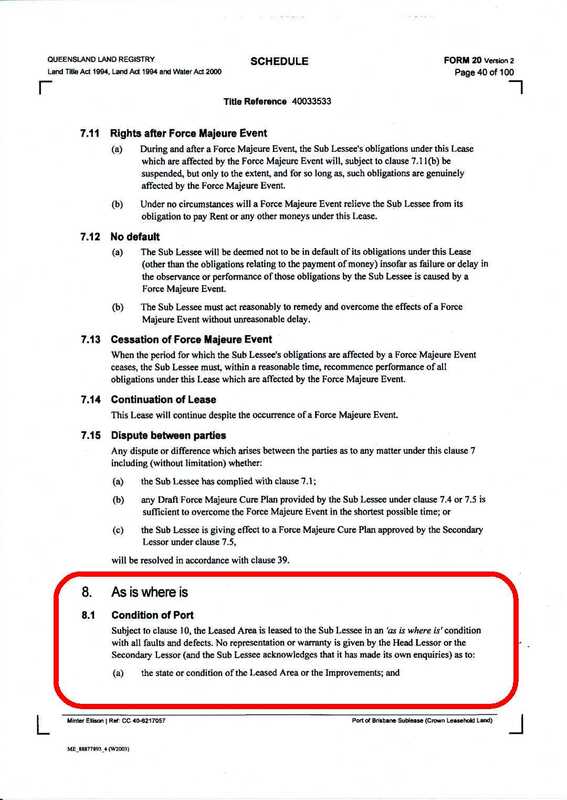 Of course no payment of compensation whatsoever. 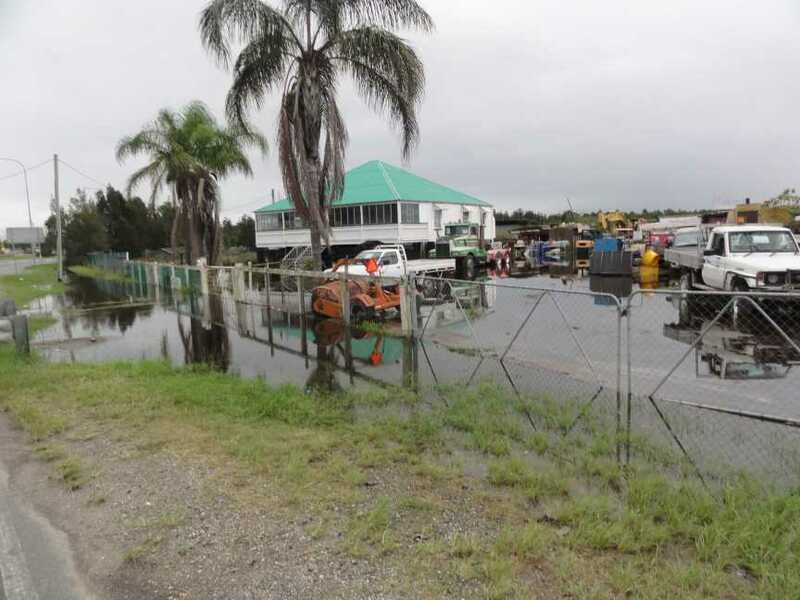 Both of these flooding occurred because of work by undertaken by Queensland Transport and DBIRD. 29 April 2012 Lindum Road, Lytton. 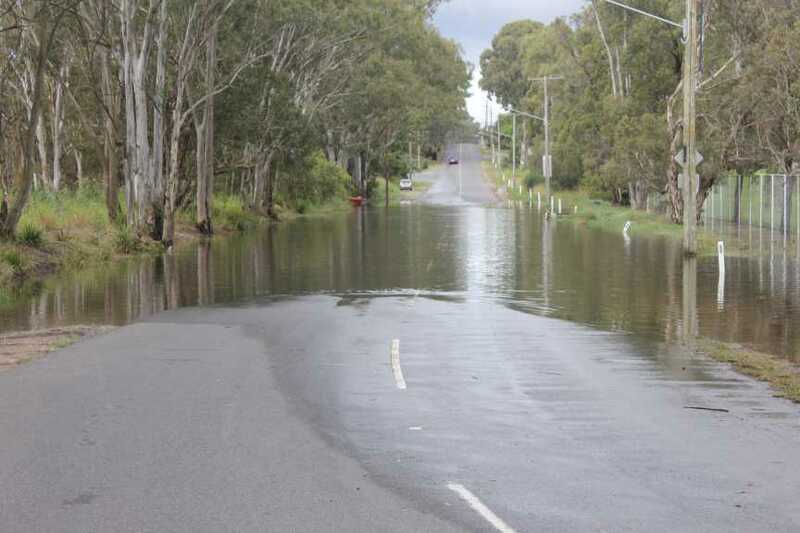 Sandy Camp Road Wynnum West. Iona College right hand side of road. Cnr. North Road and Sandy Camp Road Wynnum West. 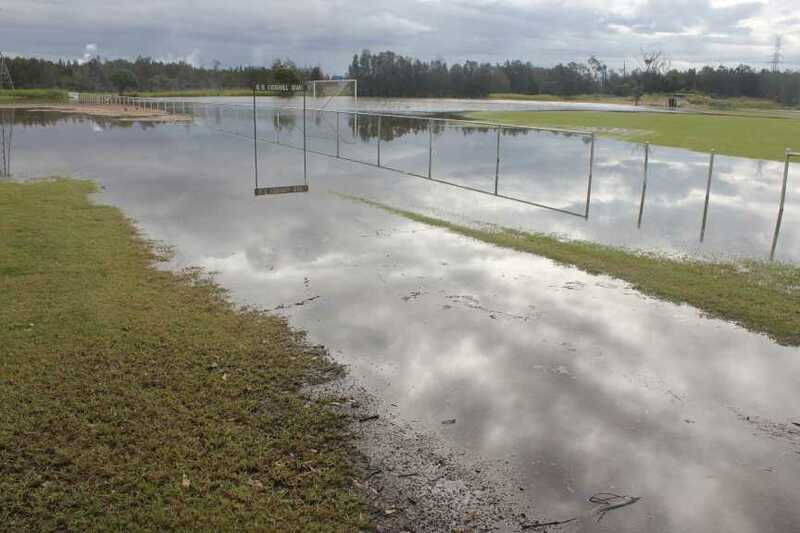 Looking across more of Iona College Sports fields under water due to Port West actions of blocking the only drainage channel, Channel 4. 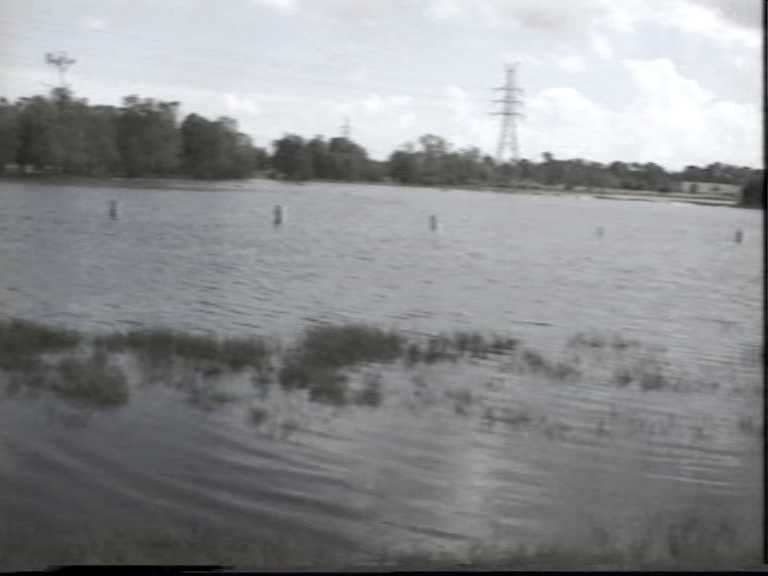 To make it worse on this day there was a boom gate problem at Lindum Railway Station and police were diverting traffic through this flooded road. 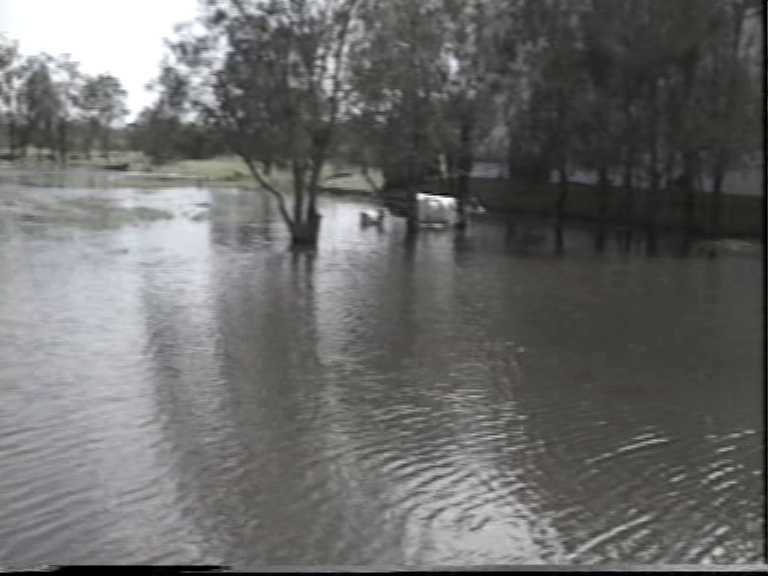 The sign on the front fence explains who is responsible for the unnecessary flooding. 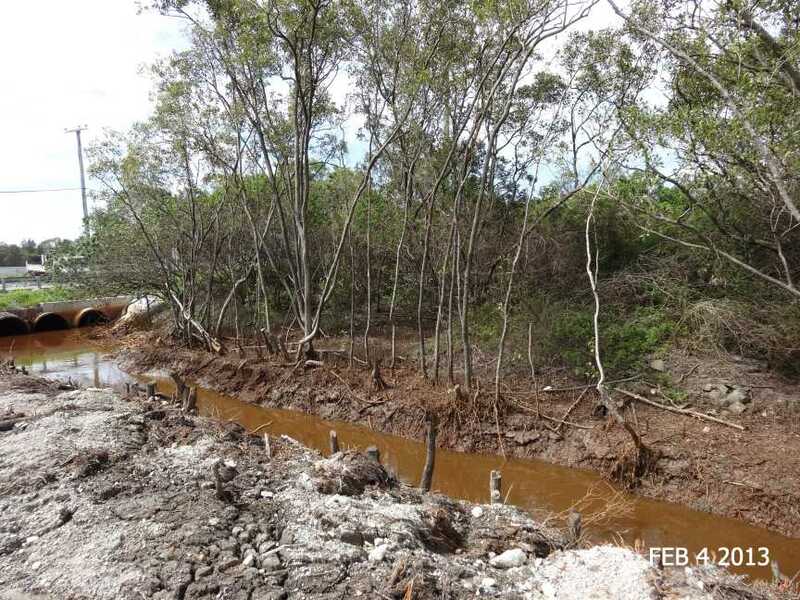 What did Queensland Transport Senior Engineer in charge of this project say about their action to prevent such occurrences just six weeks before this happened on a weekend of 29 April 2012. 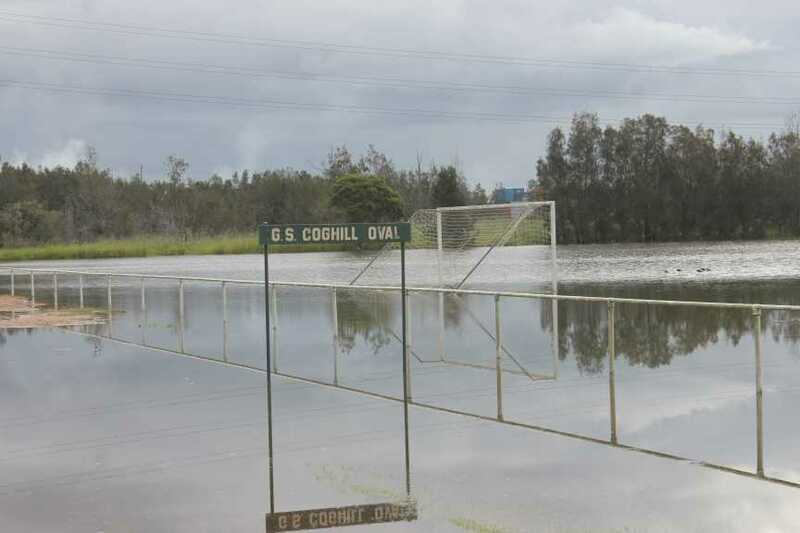 "Port Connect work will not result in any more than a 10 mm flood increases." "D.O. advised that Mr Barry Wilson was surprised that works happened in the wet season. A.U. 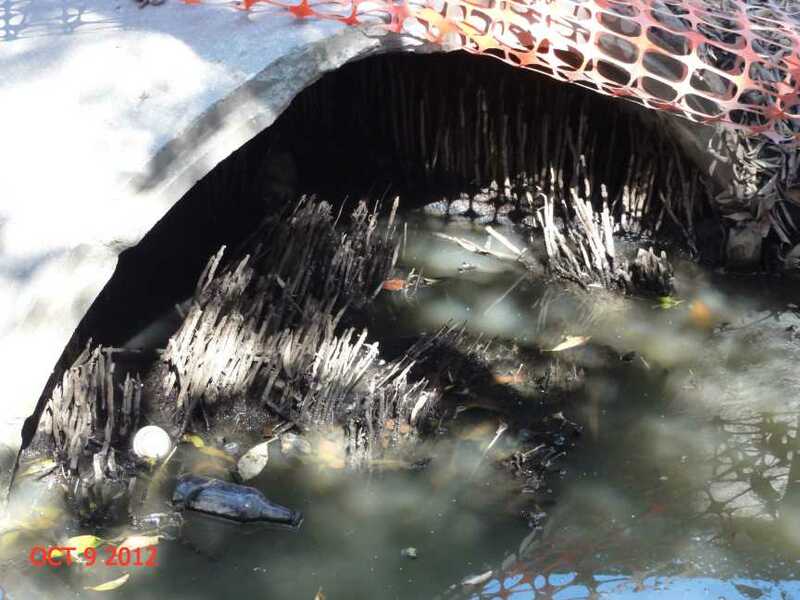 advised that drains are not entirely blocked off during construction. 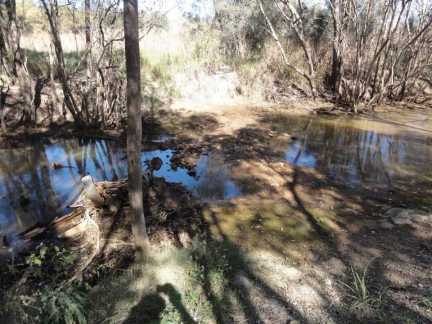 The impacts of rain events are actively managed to balance the effects on the site and upstream areas. 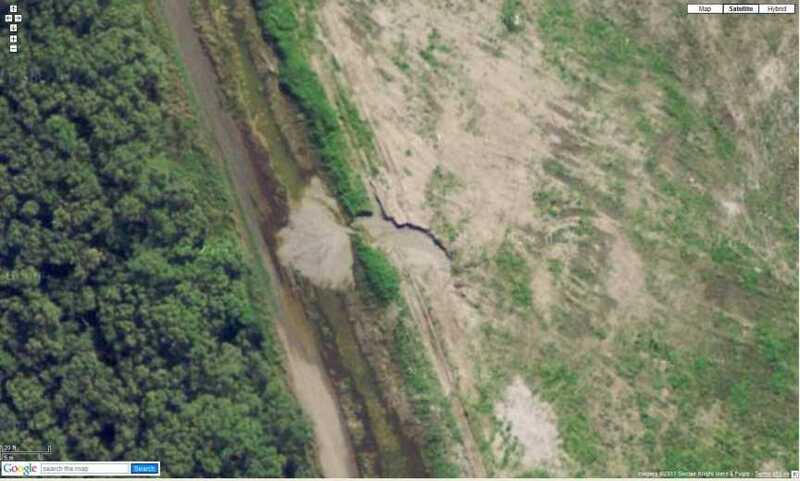 Quiz time: Spot the diversion Channel? 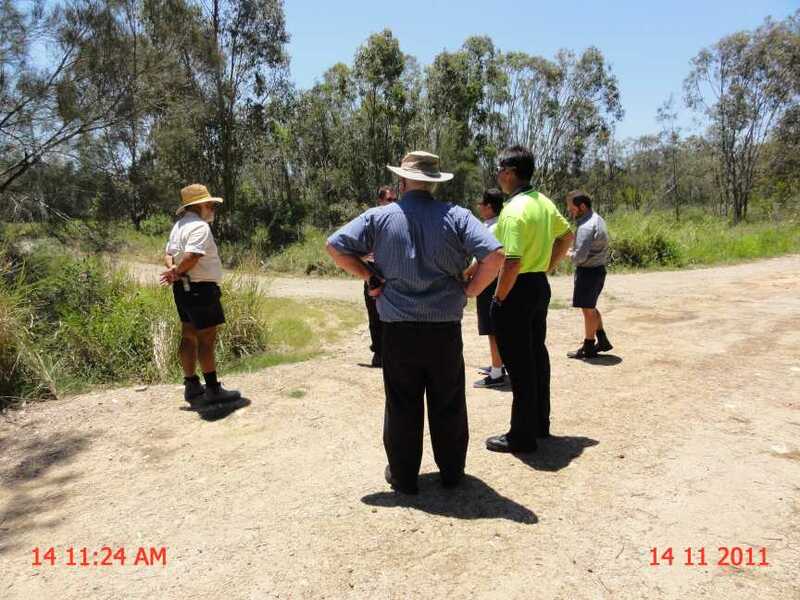 Community meeting told that the drainage channel are not completely blocked off. The building of the "Green Bridge" across Channel 4 along Lytton Road Lytton. 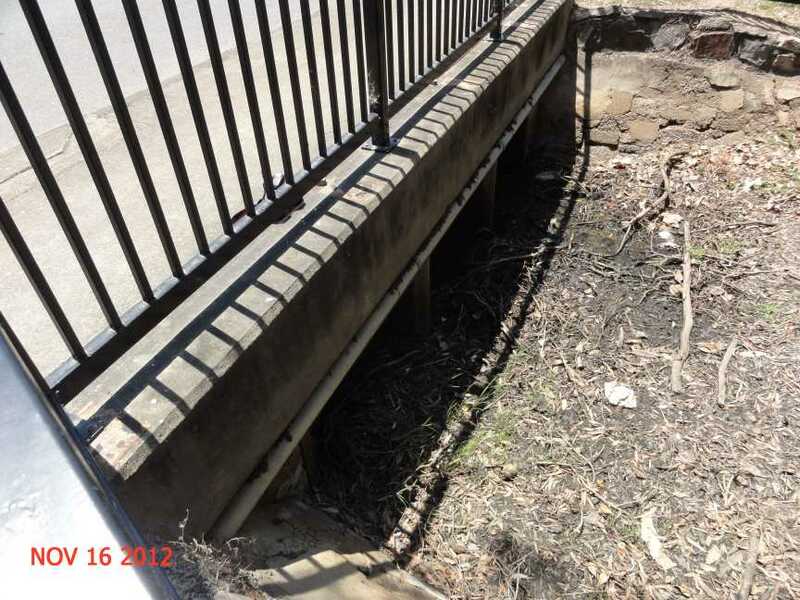 Please note that engineer stated that the drains are not completely blocked off during bridge construction. Can you find any part not blocked of in the photo above or the two photographs immediately below? Photo of 102 Lindum Road Lindum (now called Lytton) after Lytton Road (built as a retention dam) upgrade in 1960s. 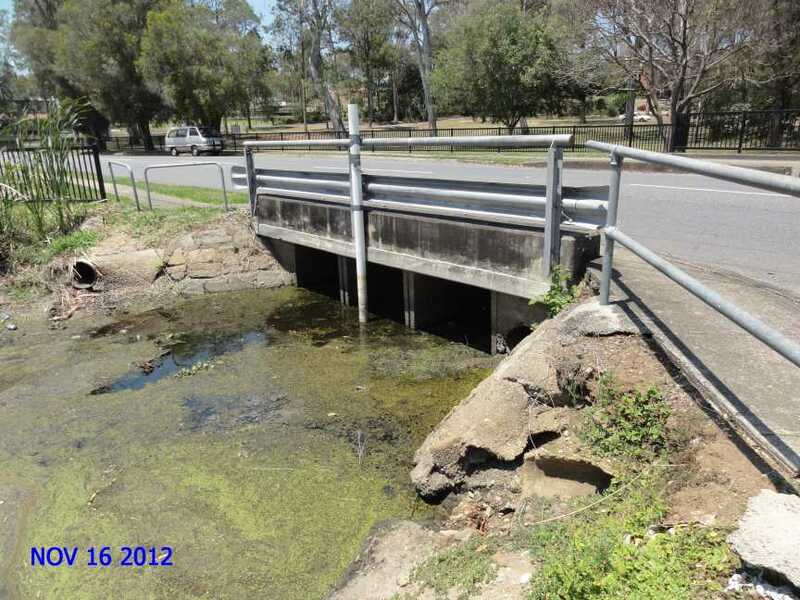 This is a direct result of the lack of drainage under Lytton Road to the Brisbane River or Bulimba Creek and the sad state of the drainage channels in the area. 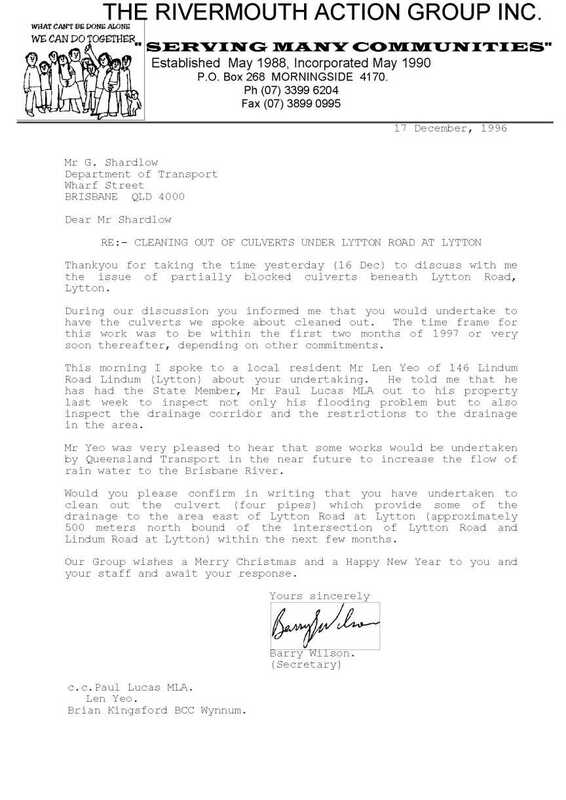 When did the Lytton Road Culverts need cleaning out? Well prior to 2 June 1995. 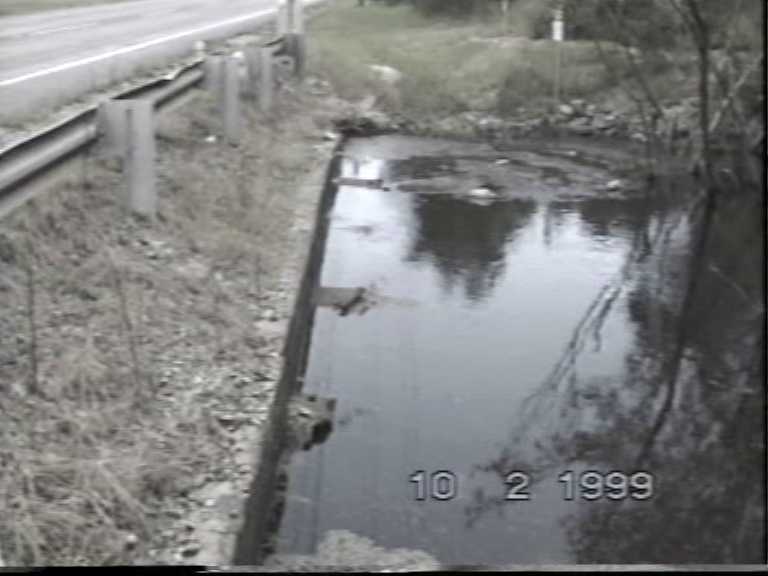 These images below have been taken from video 8 tape made on 28 February 1997 as you can see in following images that some company had put a concrete slab across the drainage corridor about half way up the the height of the culvert pipes. 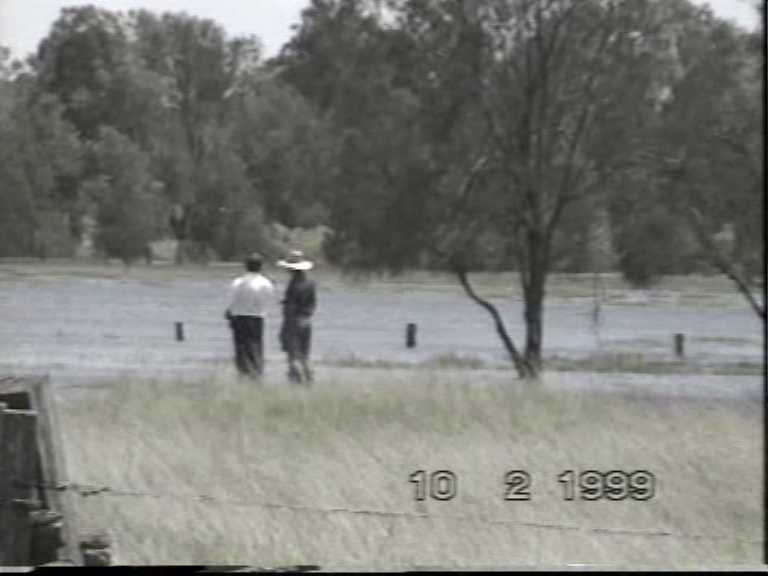 20 months after my first video on 2 June 1995 I took more video. What did they find with this equipment ? 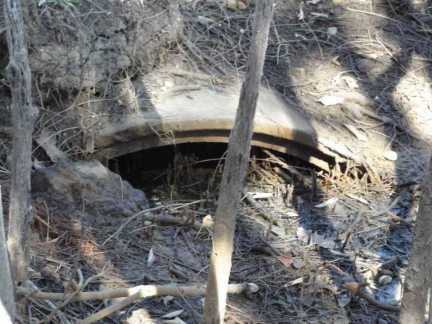 Beneath this concrete slab which was half way up the height of the culvert was covering a oil or gas pipeline. Looking through the culvert (looking upstream) to show the height of the concrete slab. 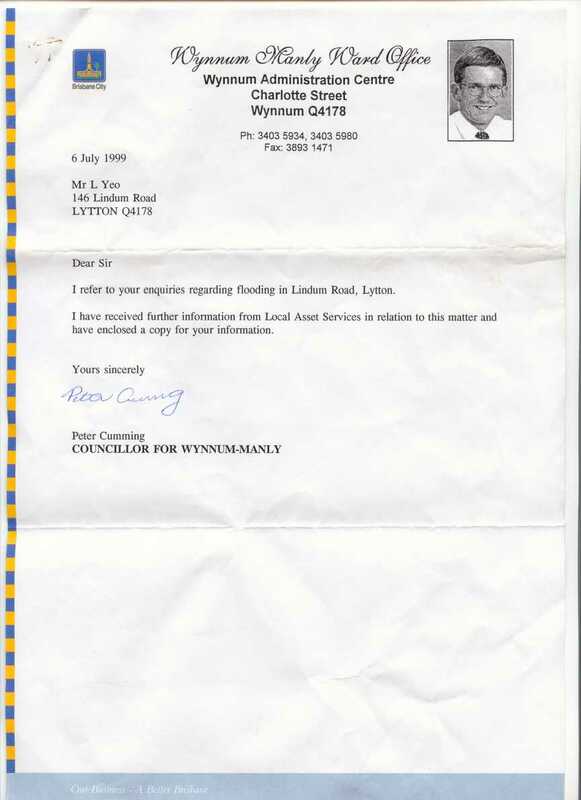 Mr Len Yeo A returned service man who served several theatres of WW II had lived at 146 Lindum Road Lindum (now Lytton) since 1941 with his parents and several siblings. 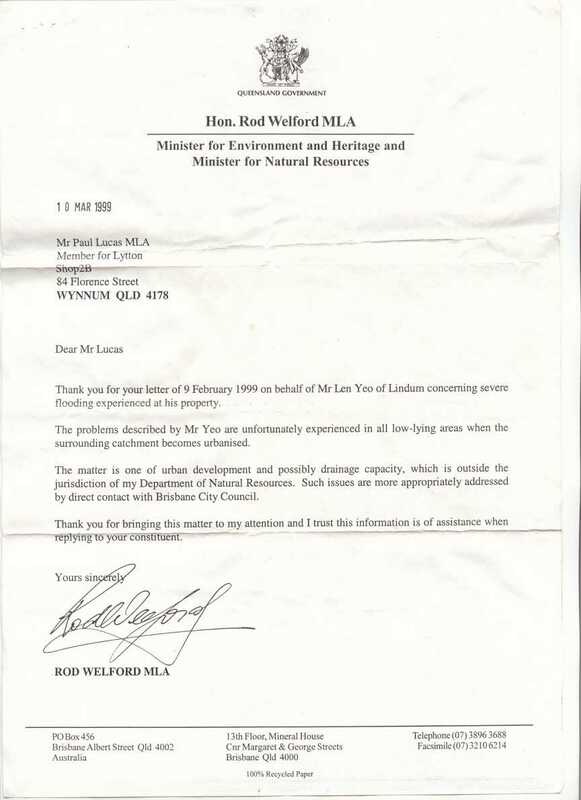 Mr L Yeo worked for many years at the local meat works along with his brothers. When he built up a poultry business to be self employed with the production of fertile eggs for the export of chickens to New Guinea. Because the egg production needed to be fertile the poultry were not kept in high in cages but in pens with the freedom to move about. And on different days allowed outside to forage for themselves. 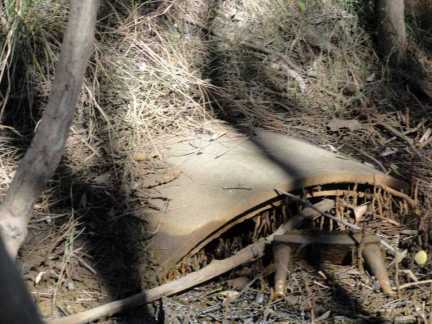 This enterprise came to an abrupt end and he lost his income due the actions of the Queensland Government. 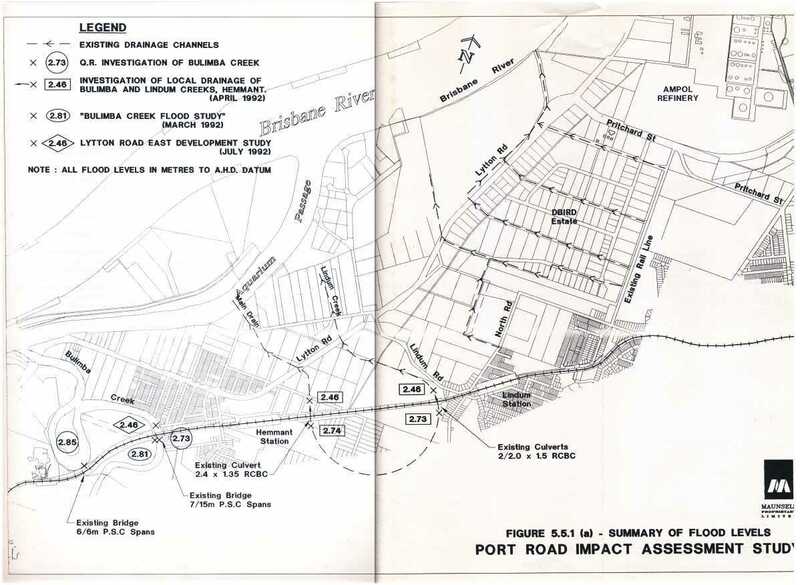 Firstly due to the building of the upgraded Lytton Road and secondly the resumption of land to the north of his property and the undersized and unmaintained drainage channels and the action of the Port of Brisbane Corporation who allowed the dredge spoil to flow unimpeded in to the main drainage channel thus restricting its tidal flows. 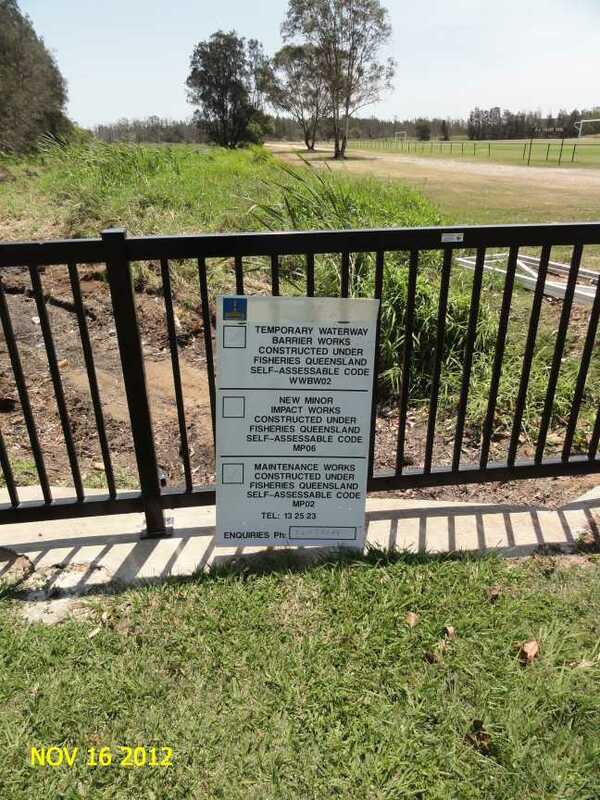 This was exacerbated by the removal of the tidal flood gates downstream of Lytton Road as well as every other flood gate on the Brisbane River side of Lytton Road. 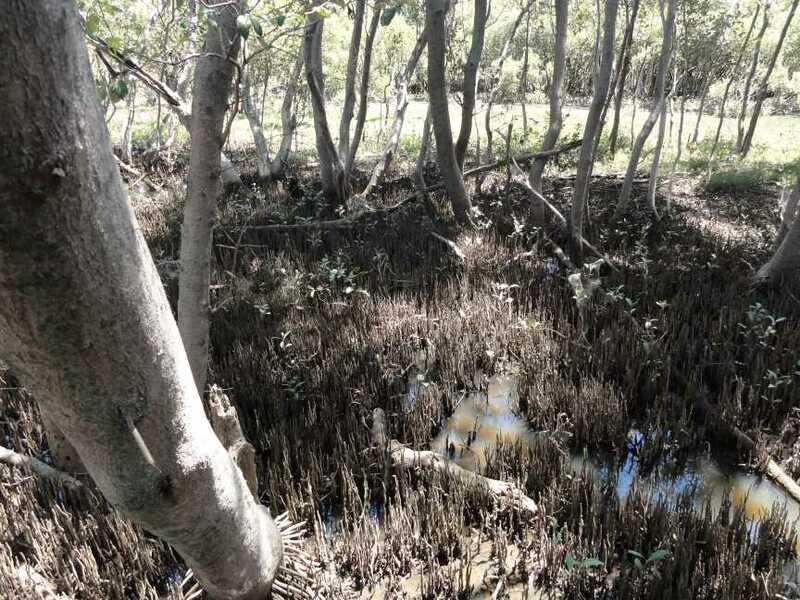 This allowed mangroves to infest the banks of the undersized drainage corridors and for the fine dredge silt from Port West reclamation to be transported up stream on the rising tides over many years. 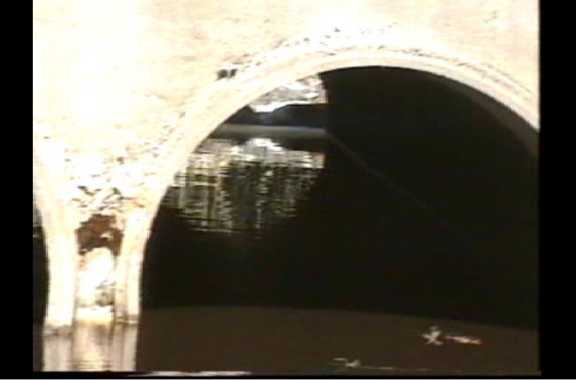 The results of this sediment can be seen in my photographs taken in 1995 of the Lytton Road culverts. The only upstream development during this time has been Government development of their industrial estate. 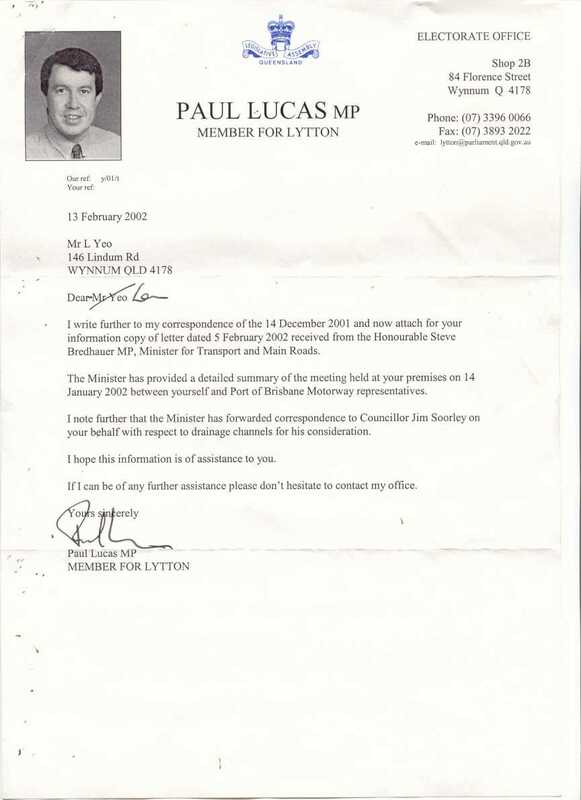 The cruel part of this was in his later years because of his so called assets which were being flooded without warning he was reduced to a life of poverty by Centrelink and Repatriation payments due to Queensland Transport stupidity. 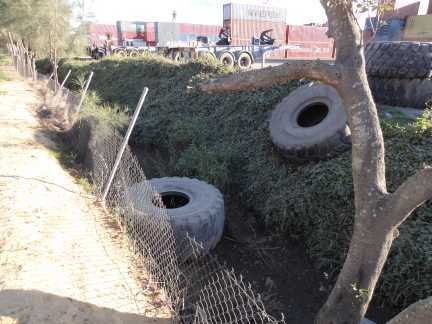 His many calls for assistance to his local councillor and state member to undertake some drainage works resulted in no action whatsoever by any of the authorities. We have faceless men in positions of authority who just don't care about the little man trying to support themselves. 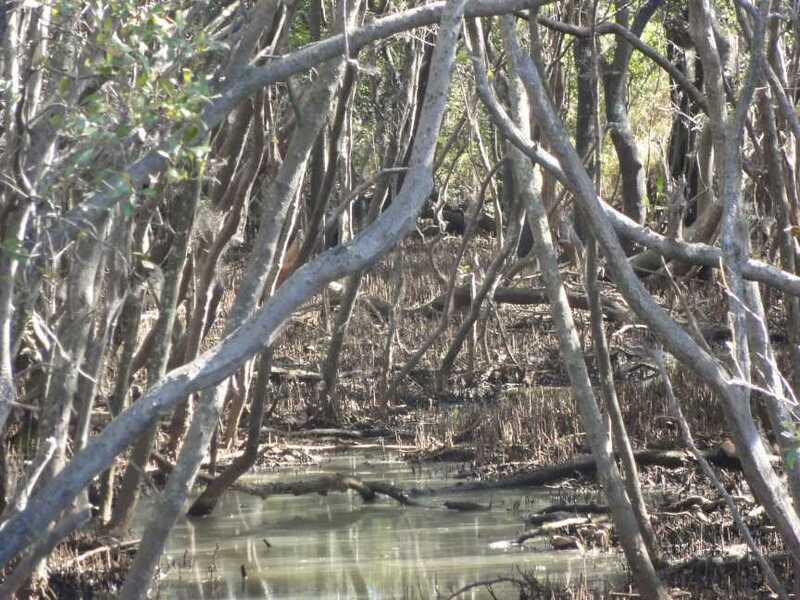 The Queensland Government who caused this whole problem over the past 40 years and were not willing to undertake and remedy must hang all their heads in shame. I had offered to make some phone call on Mr Yeo behalf in years gone past but I also found myself hitting my head against a solid wall of we don't care and just go away we are not interested. Mr Leonard Yeo passed away earlier this year (2012) just short of his 92 birthday. 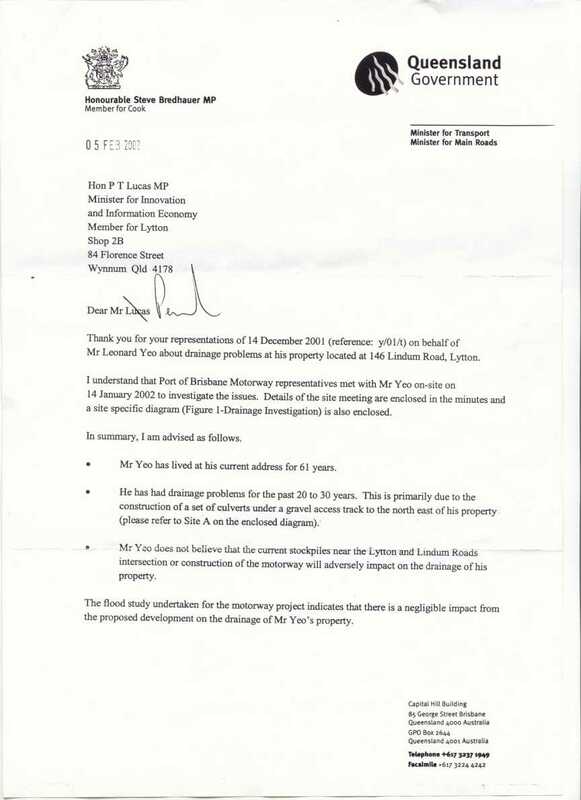 I was hoping to give him some good news before that sad event but it appears I still have no one of any importance listening to the concerns of the community about the drainage in the Lytton and Hemmant areas even after all of my efforts over 19 months. 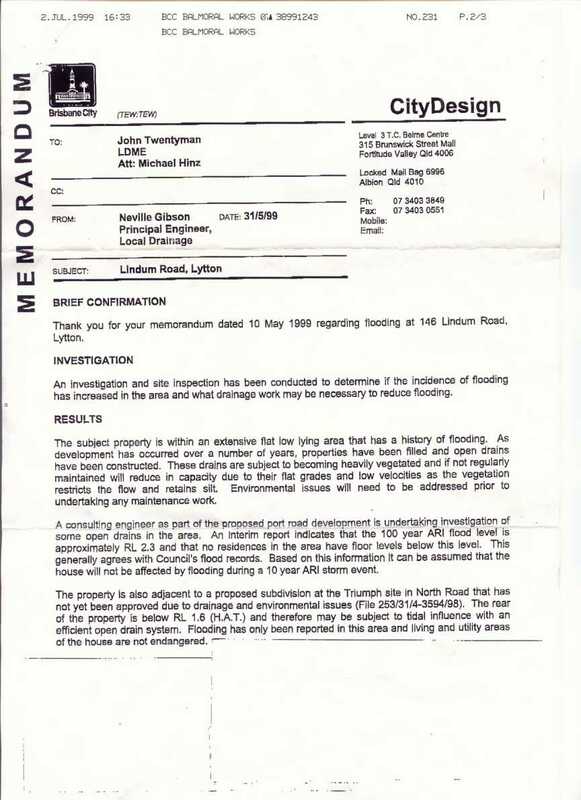 What did up stream Iona Drain look like at this time from 146 Lindum Road, Lytton? Len Yeo on right wearing a hat. Person on right could be Paul Lucas or John Campbell or else a BCC inspector. A series of photographs starting at the upstream side of North Road adjoining Iona College. 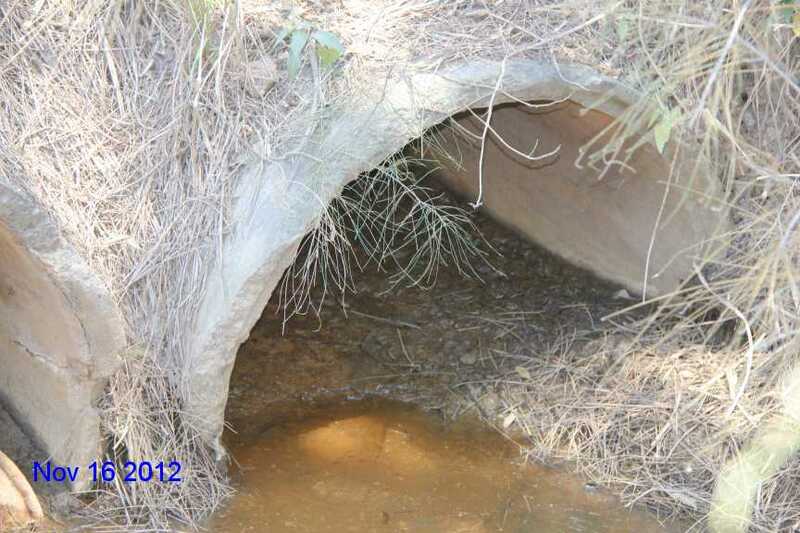 Why is it that upstream culverts are always larger than downstream culverts? 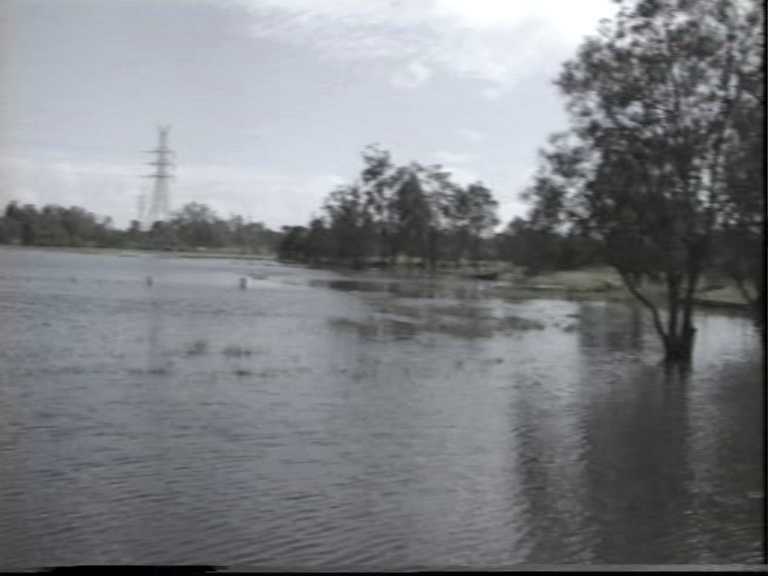 Downstream side North Road Wynnum West Iona College in background. 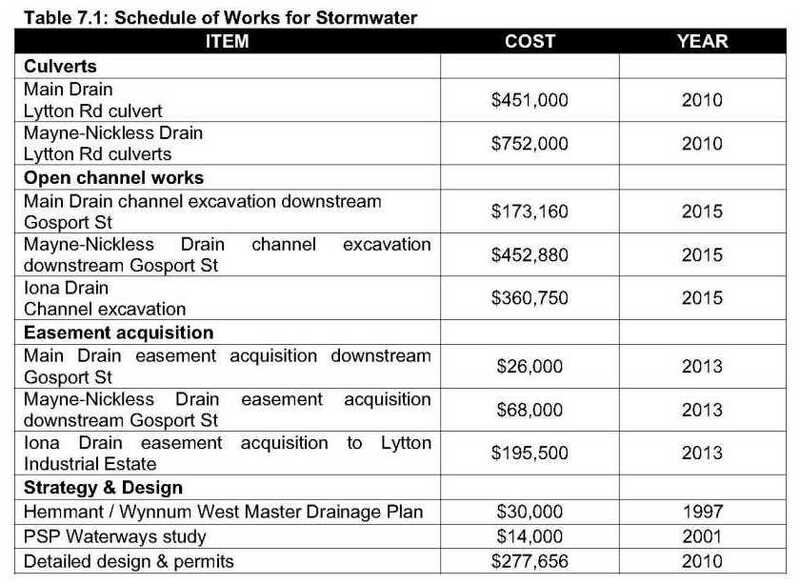 Brisbane City Council Permit to undertake works. Looking downstream (west) from North Road. Looking Downstream from North Road. Looking upstream towards North Road. Looking west along drainage channel. 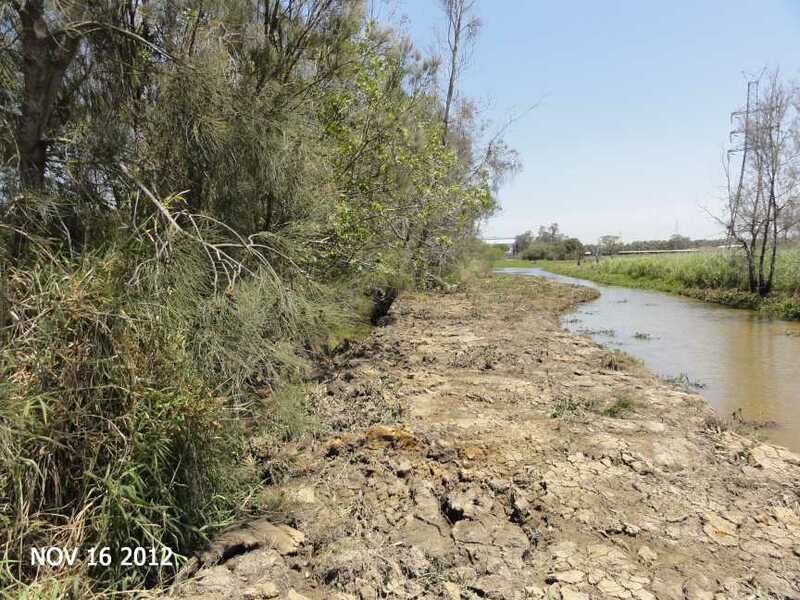 Looking north along Iona Drainage Channel. I also noticed the lack of any lime being placed on the excavated soil while it is drying out as this area is known for Acid Sulphate Soils. The areas is certainly below 5 m AHD. Looking south back along north south Iona drainage channel. Looking North along Iona Drainage Channel. 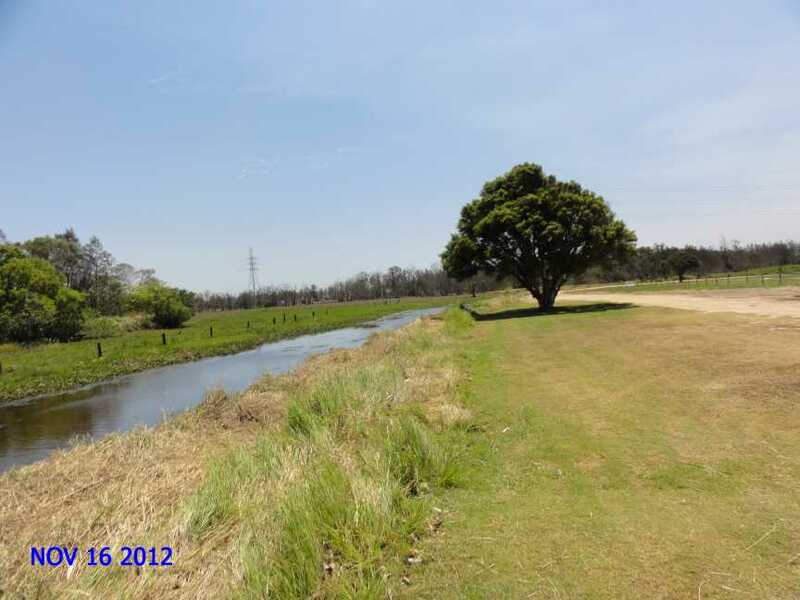 Back of sports fields. Temporary end of Iona drainage works. More work to follow? Looking north along Iona drainage channel behind the container park. Looking south from north east corner of container park. 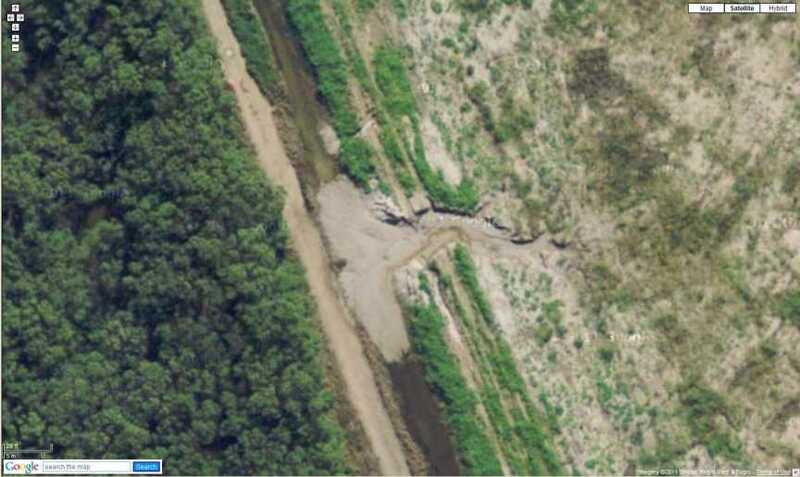 Condition of this same area above as at 28 July 2011. 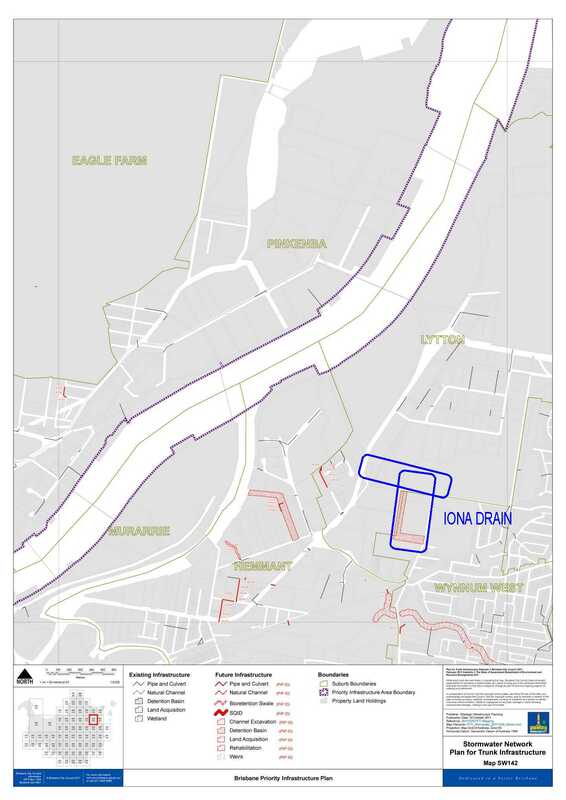 Iona Drain now enters Brisbane City Council Park land. This has not always been the situation. The land north of here was once owned by a local dairy farmer as I understand or he leased it and every morning he walked his dairy herd across Lytton Road to graze on this area. 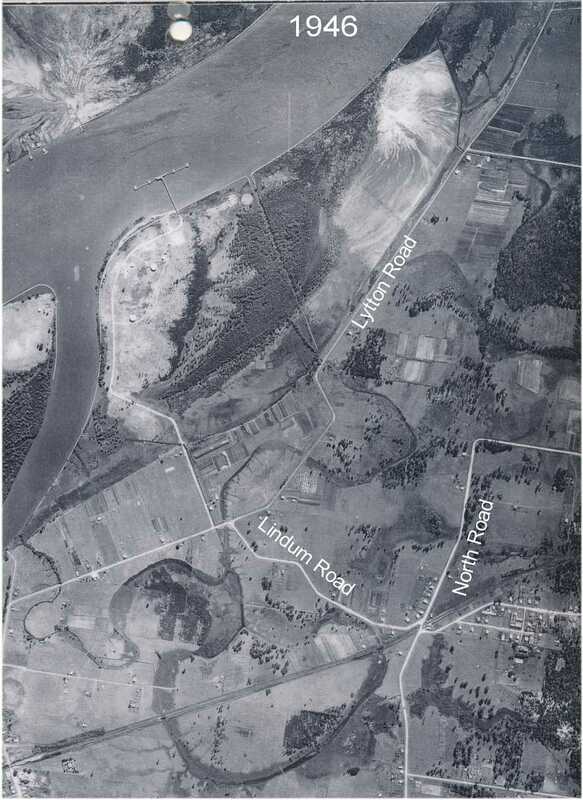 The Queensland Government in their wisdom resumed all land north of the extended Sandy Camp Road, Wynnum West (then Lindum) for harbour zoned industries. 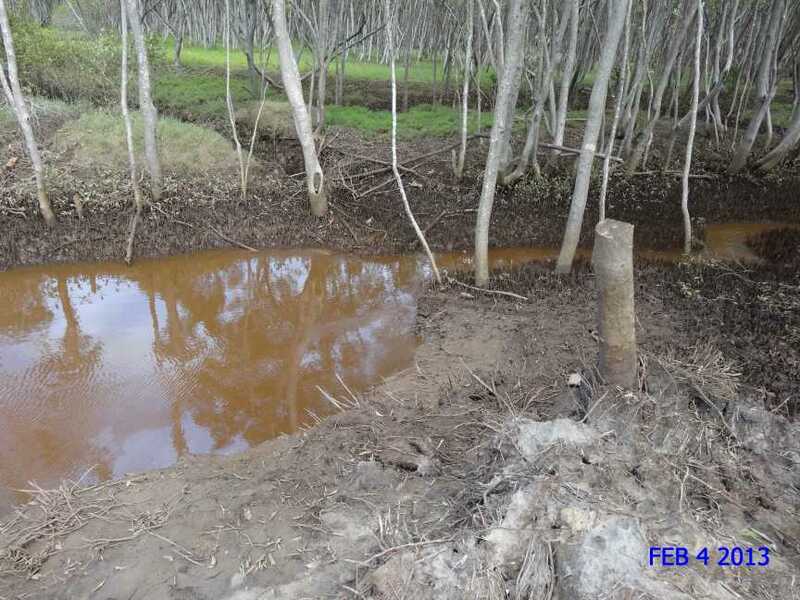 This resumption of land included 4 dairy farms. 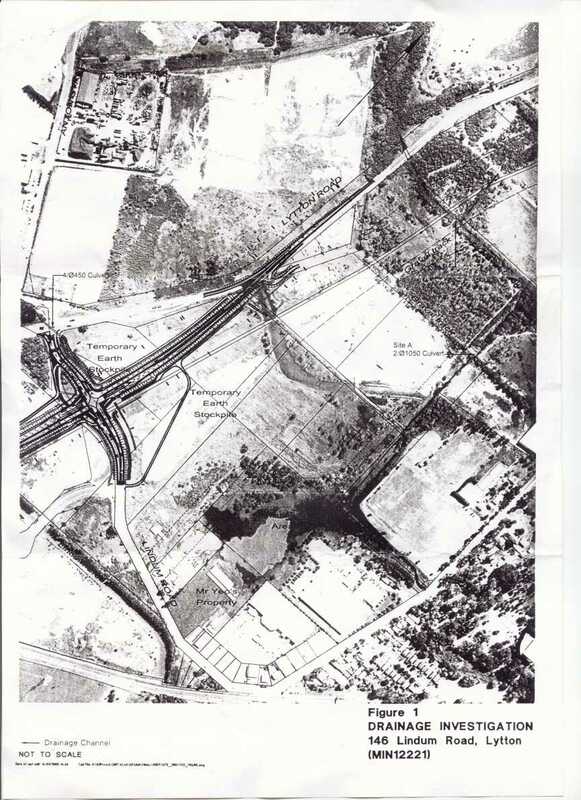 The Department of Business and Industrial Development then progressed to fill nearly the entire wetland areas to allow for the Lytton Industrial Estate. 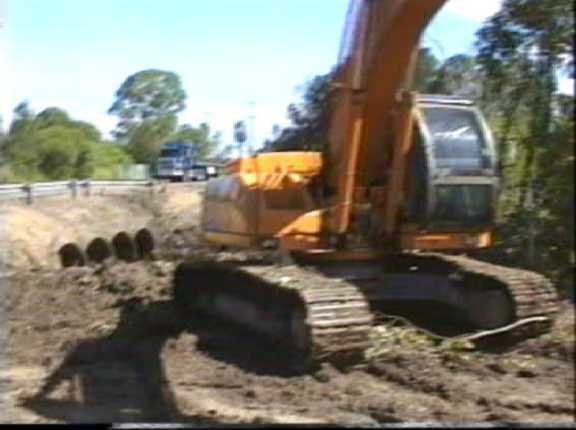 In doing so some drainage was installed but way under the size required for the catchment area involved. At some stage after these pipes above were installed and flooding was experienced some open drains were installed. 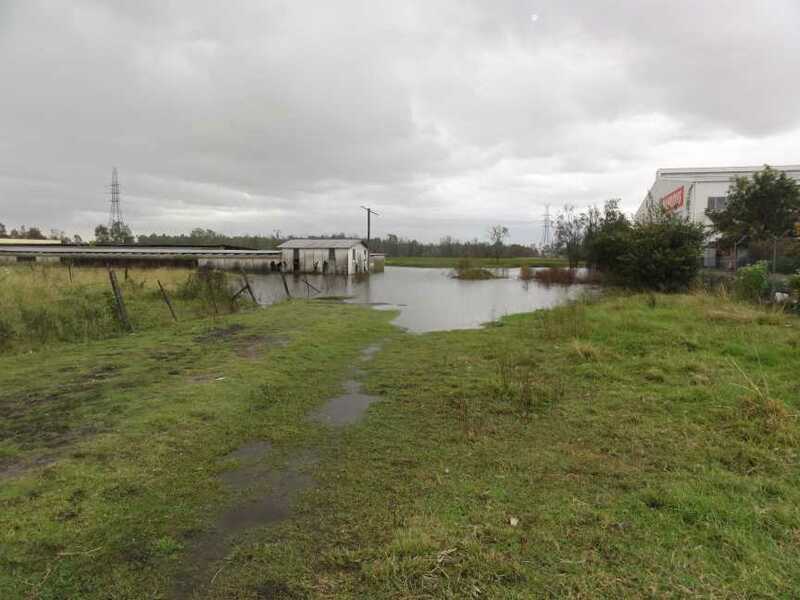 Because of the inadequate drainage capacity north for Iona Drain flooding became more frequent, higher levels were experienced and it took longer for the catchment to reduce the flood levels. 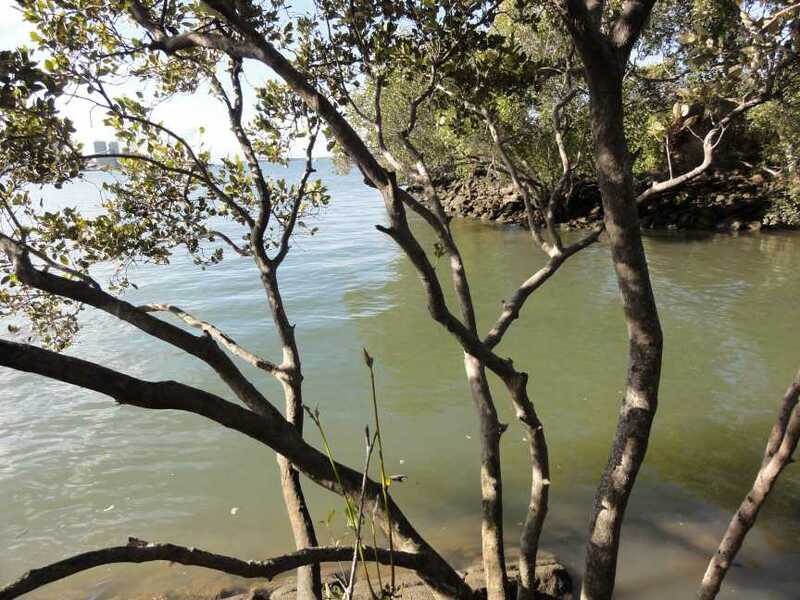 Year after year, complaint after complaint from land owners always fell on deaf ears both local council and councillors, State Government and Elected members and the Port of Brisbane Corporation and its many predecessors. 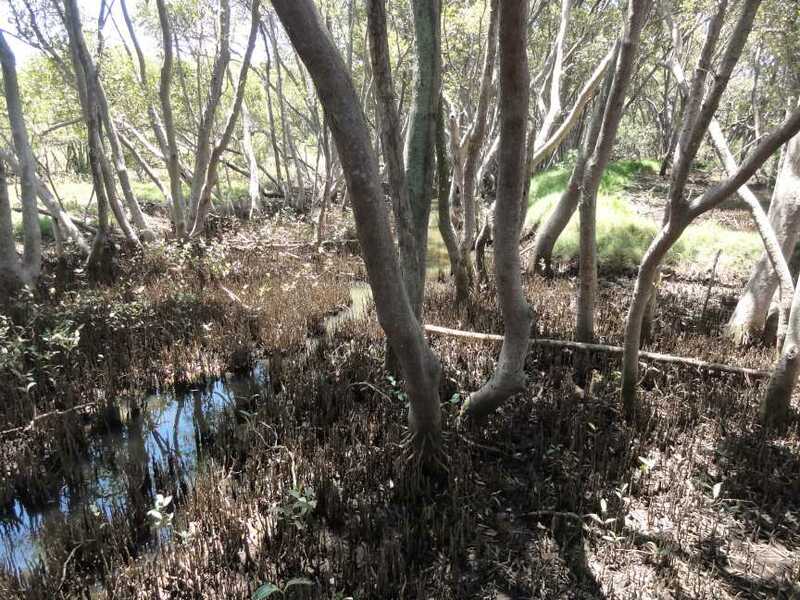 Below is the section of Iona Drain entering land presently held as Brisbane City Council Park Land. Looking east from North East corner of container park. 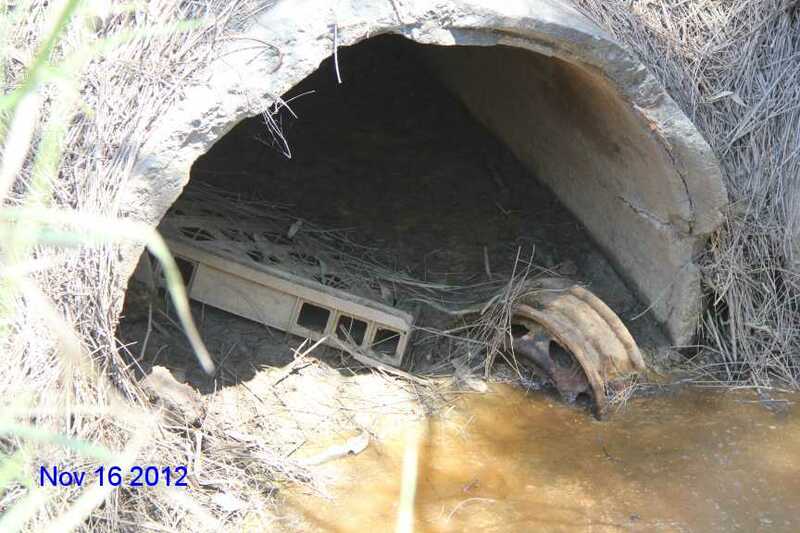 Notice the 2 pipe culverts to the left. Installed about 40 years ago and way undersized for catchment and much less capacity than the existing culvert under North Road upstream. 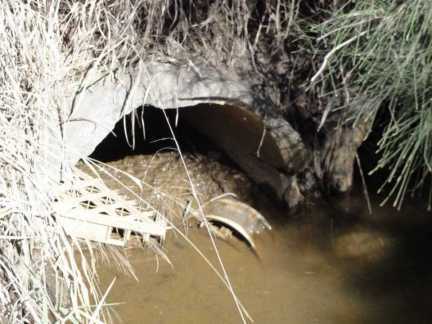 Looking through the western of the two drainage pipes, south to north. 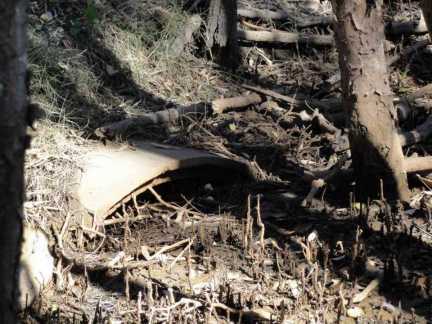 A further view inside of the western pipe. 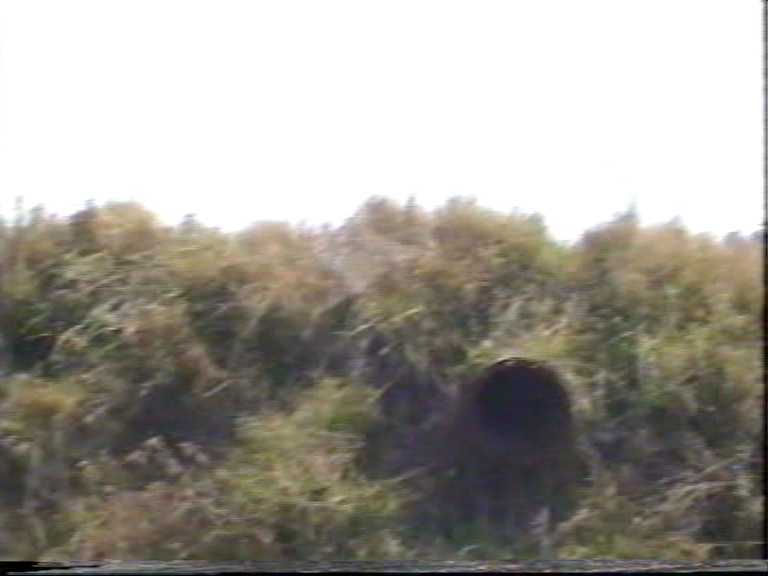 A view through the eastern of the 2 pipes. 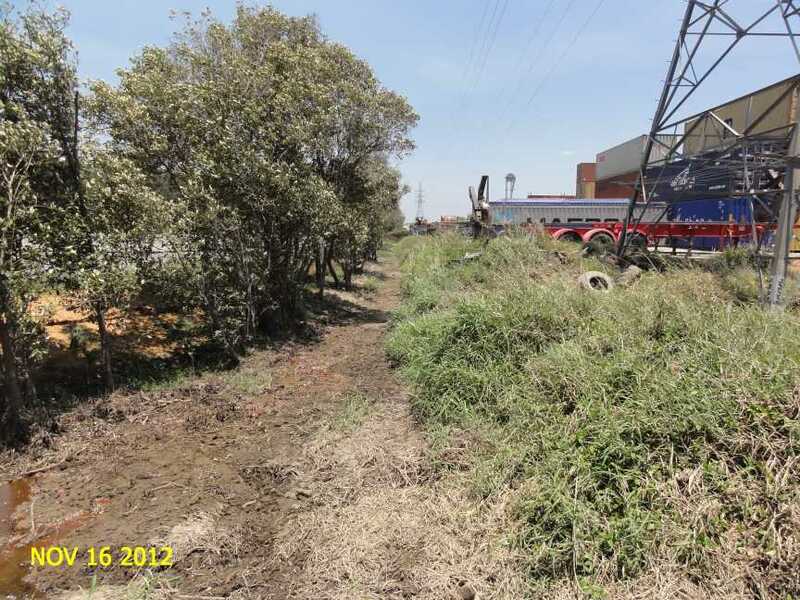 BCC engineer suggested that the road should be lowered but has been raised in past 2 months (early 2012) during the installation of an underground power cable. 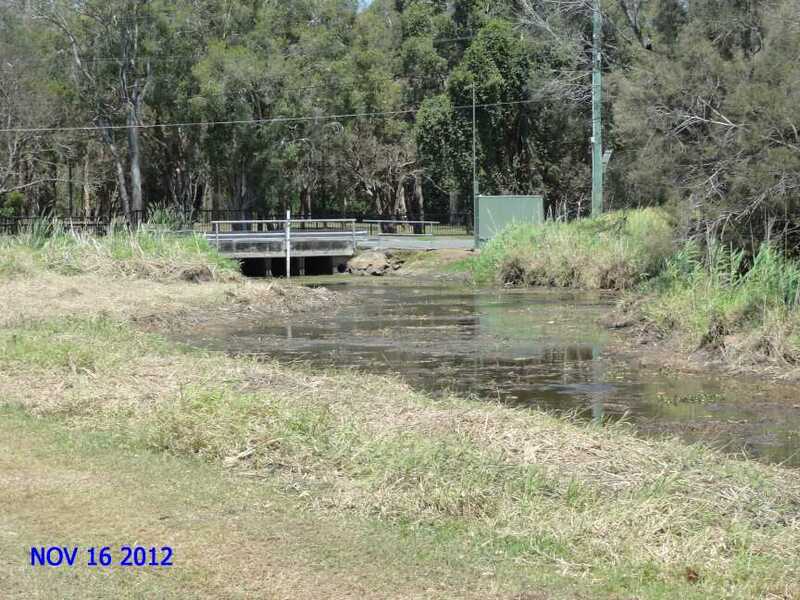 This is culvert is on Brisbane City Council owned Park Land. A view at the downstream end of culverts on Brisbane City Council Parkland which were installed by the Department of Business, Industrial and Regional Development/contractors about 40 years ago when this area was resumed by the Queensland Government and has been responsible for increased local flooding ever since. 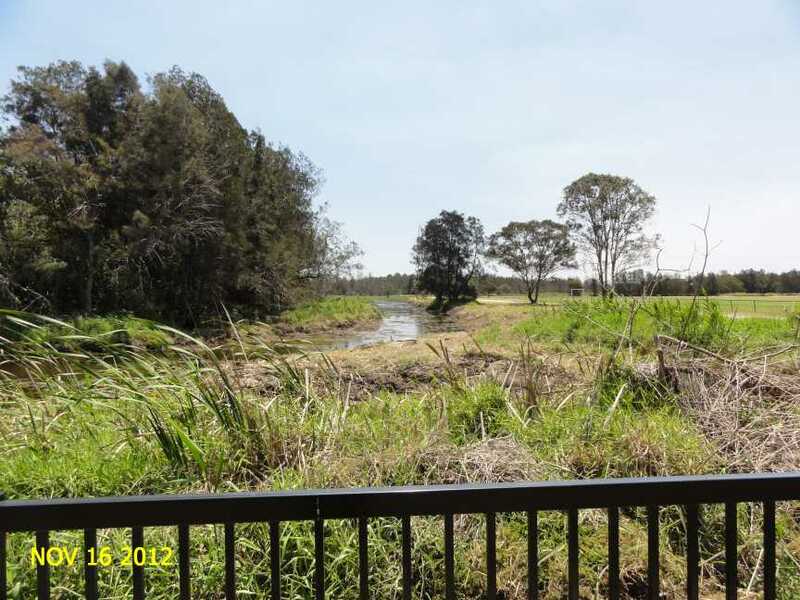 This land was passed to the Brisbane City Council several years ago for a green buffer between the industrial area and the residential areas as park land and a wildlife corridor between the Brisbane River and Moreton Bay. 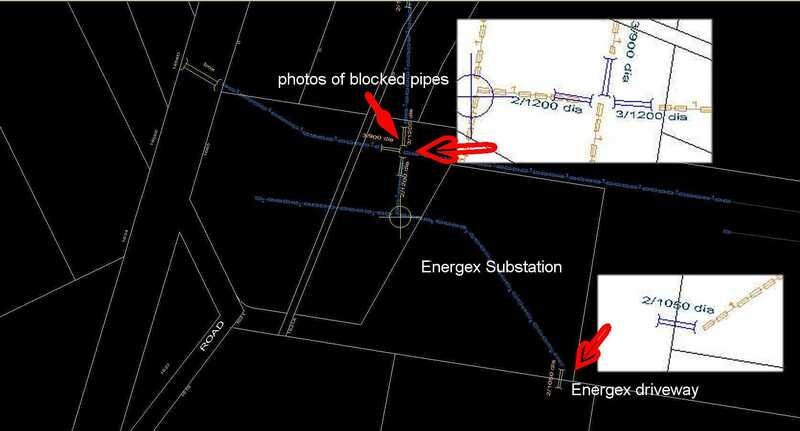 The first action was for Energex to place a substation in the middle of the corridor directly on top of the original creek/drainage corridor. Drain pipe on west side. Downstream. 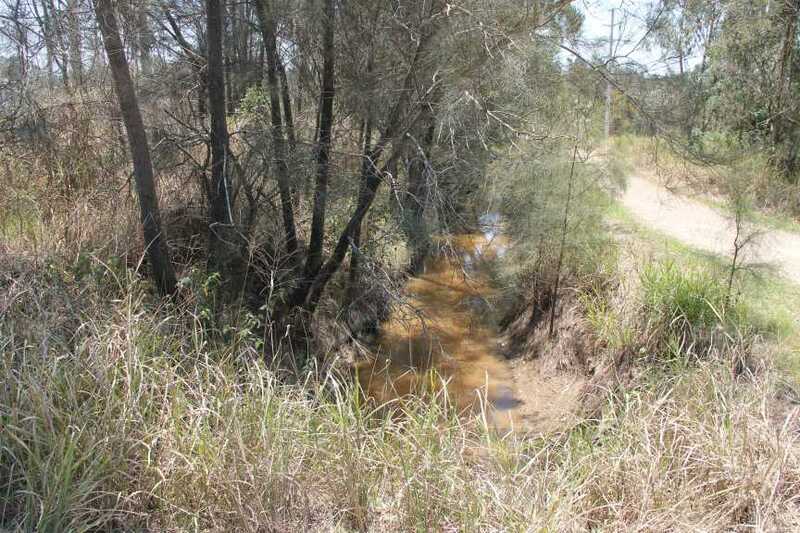 Drain from culverts looking downstream (north). 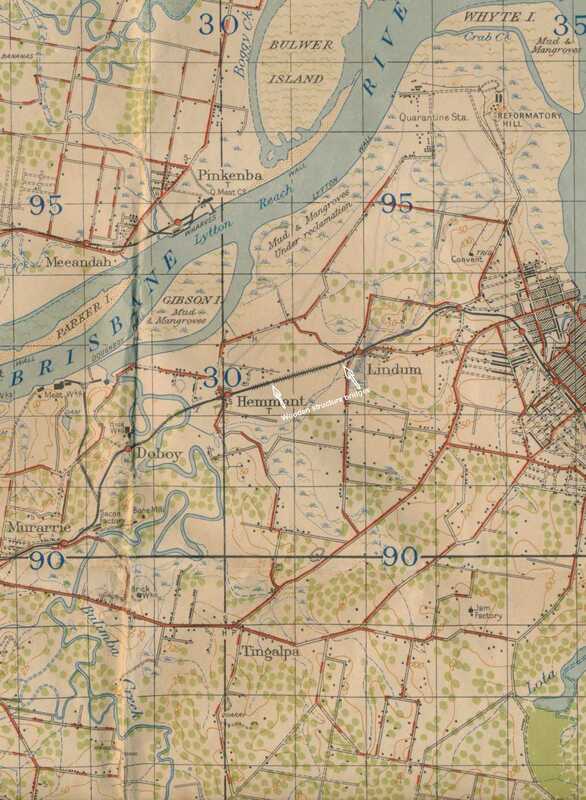 Left to right is downstream of the east to west main channel to Lytton Road. Directly ahead is the downstream drain from the previous photo above. 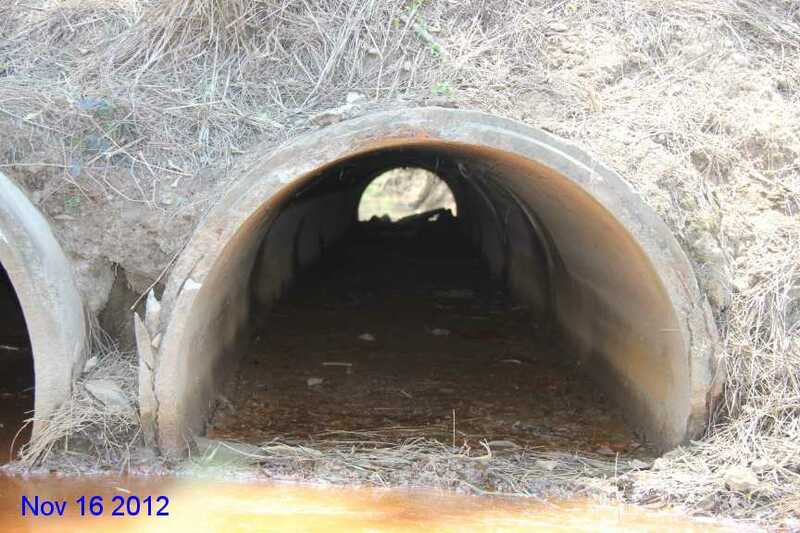 These three pipe culverts drain from the north to south. 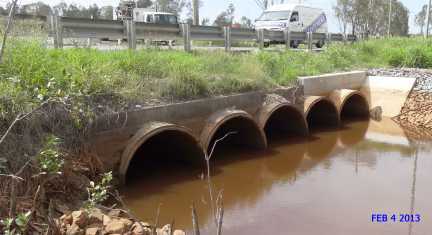 They drain part of Queensland Government Lytton Industrial Estate into the Channel 4 just east of the new Port Motorway extension. Refer to the drainage plan above. 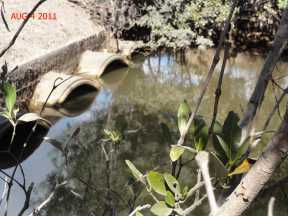 Then just a short distance down stream from these pipes is home made road across the drain. This was made between 30 and 40 years ago by unknown persons. 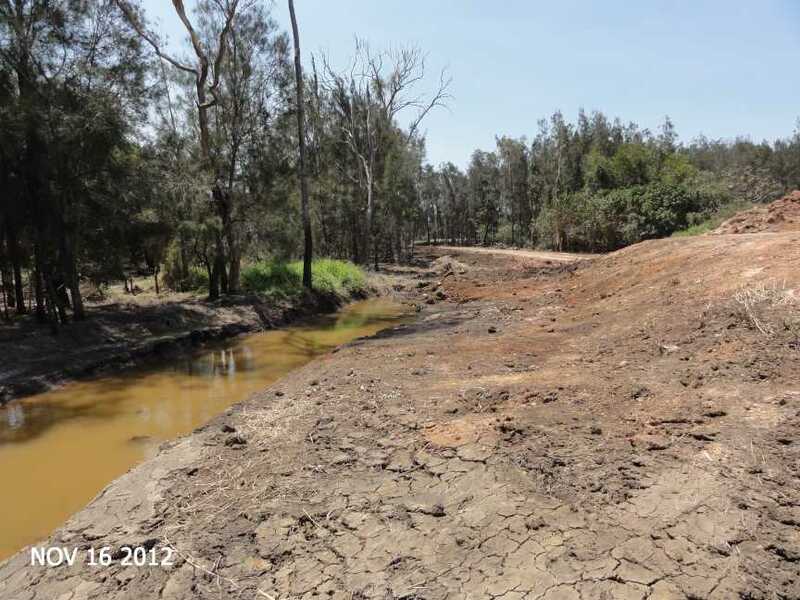 Complaints about it restricting water flows have always been ignored. This crossing restriction interferes with flood water drainage. 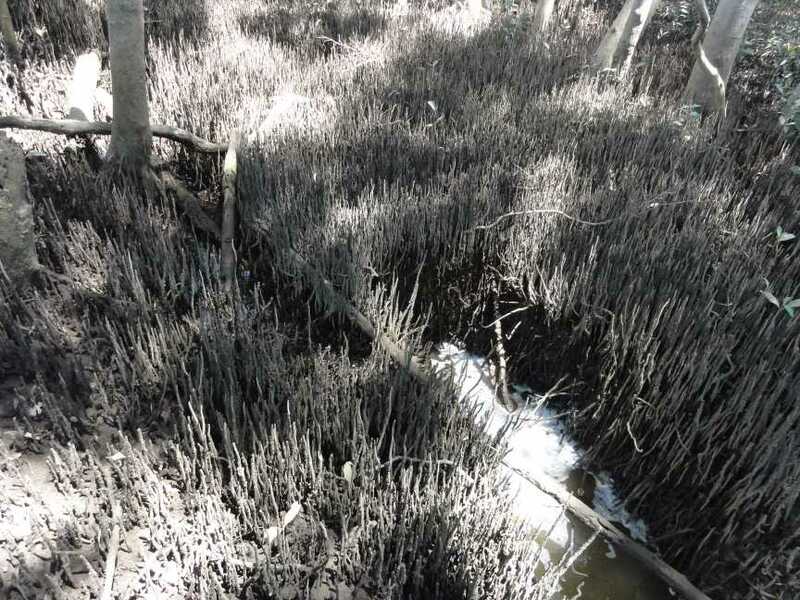 If there any pipes beneath this "TRACK" then I bet that they have never been cleaned out since they were put in 40 years ago and are not capable of any water flows whatsoever. The drainage plan above suggest that there maybe 3 by 900 pipes at this point. 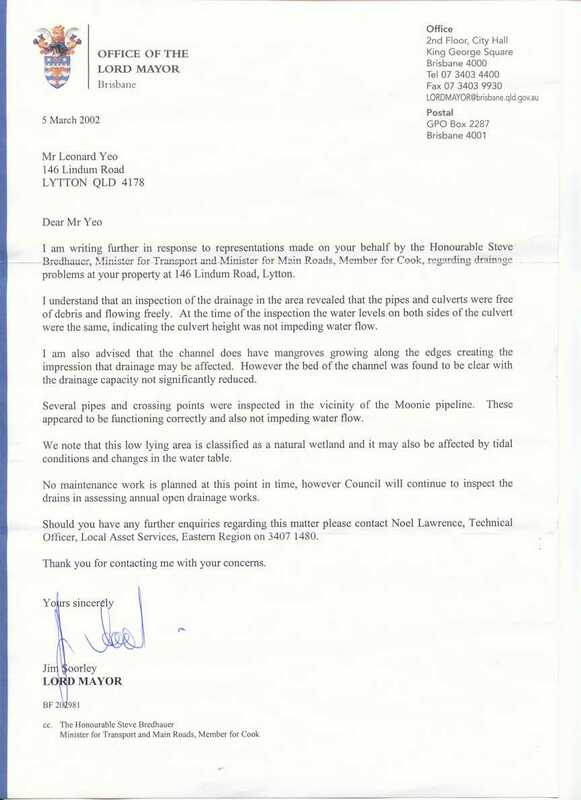 Lytton Road culverts at Channel 4. 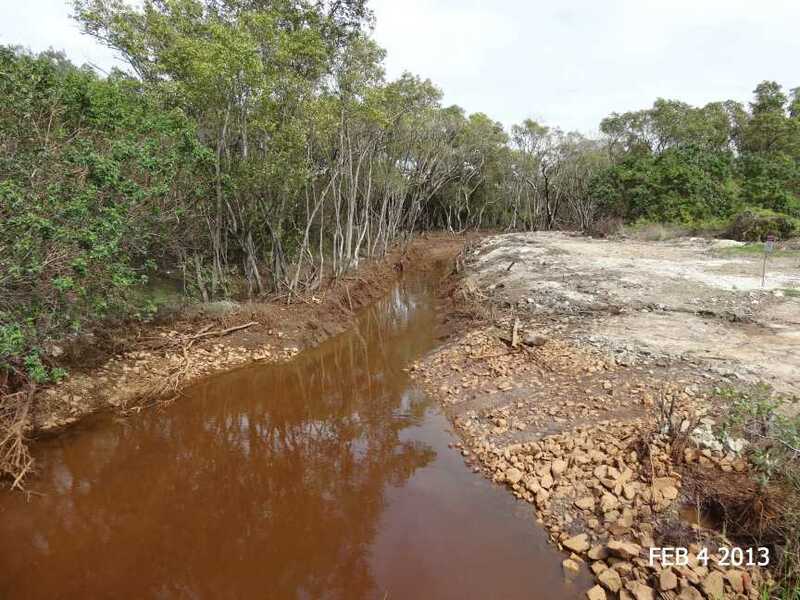 Port Connect has advised that the increased drainage upgrade beneath Lytton Road, Lytton at the drainage channel known as Channel 4 will only be increased by one more (not two as planned) 1800 pipe making the total of five. 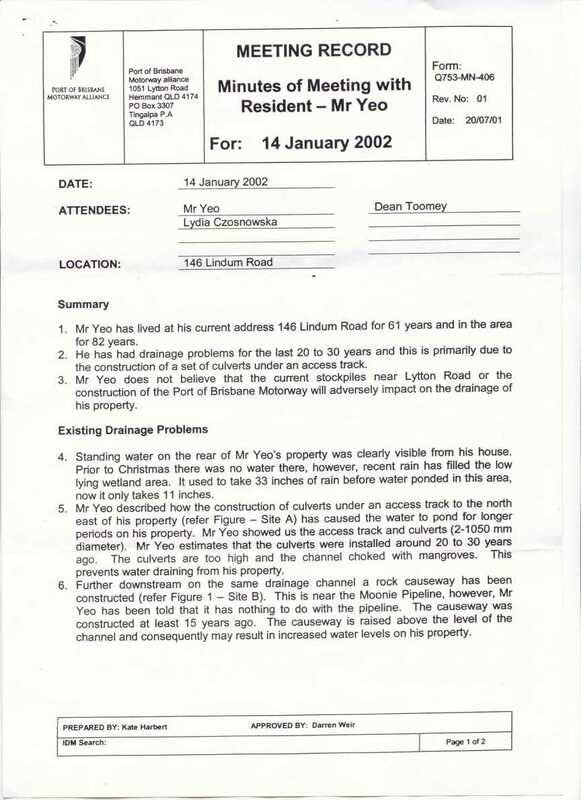 The catchment area for the Lytton Industrial Estate (Channel 2 and 3) is 118.7 ha and the drainage capacity under the Port Road is nine pipes at 1950 making a total of 36 m2 and then downstream flow (adjacent) under Lytton Road has five pipes of 1950 on Channel 2 plus 6 x 2400 x 1200 box culverts at Channel 3 giving a drainage capacity of 30 m2. In short the Government Industrial Area has drainage in excess of 5 times the capacity of the next catchment. 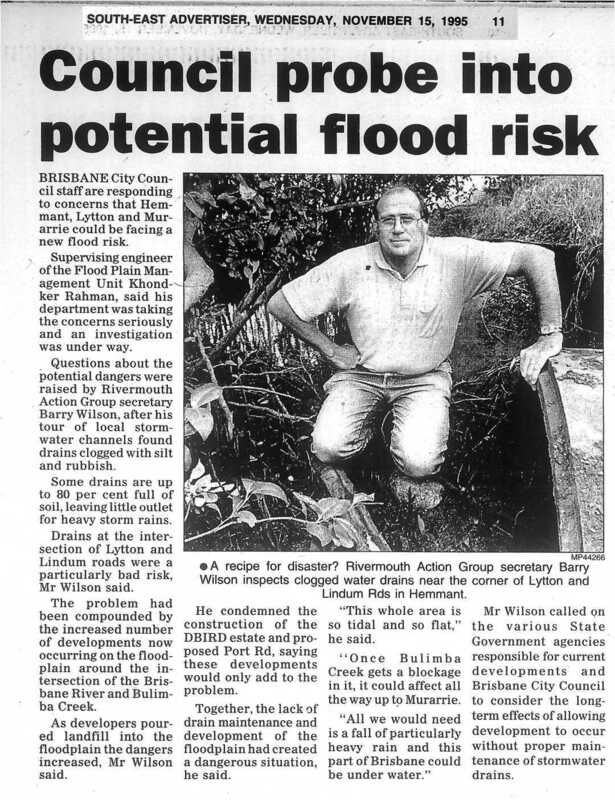 REFER to South East Advertiser item 15 Nov. 1995 further down this web page. Quite obvious this drainage was not working except to those whose in Queensland Transport whose job it was to inspect and maintain. I was informed by a senior Queensland Transport engineer (2012) that due to the small size (1.5 m to 1.8 m dia.) 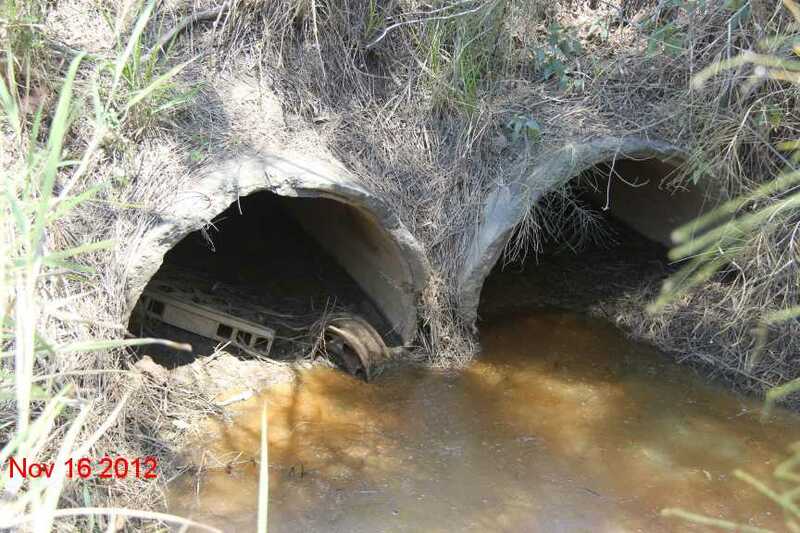 of these culverts that they are not seen as assets and therefore not checked regularly nor are they on any maintenance schedule. 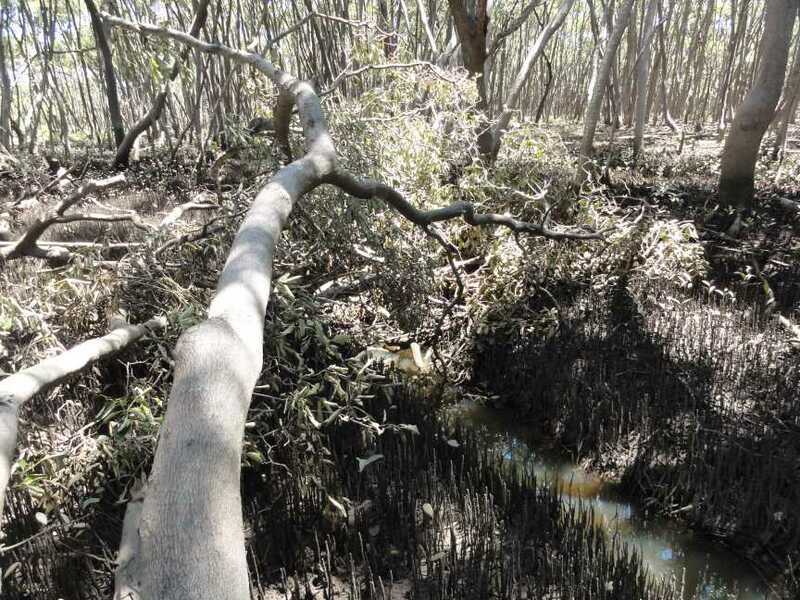 Isn't just wonderful that drainage pipes in an intertidal area of the Brisbane River are not seen as significant and that they may require a regular clean out especially when dredge spoil was being dumped nearby and overflows were allowed to flow into this drainage corridor. 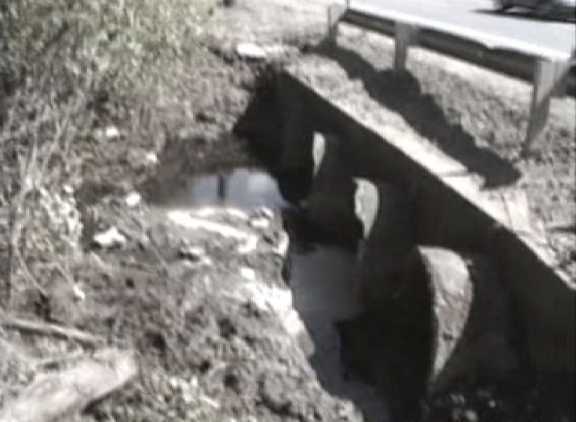 Several years ago I made a video which showed three of these culverts fully blocked and the fourth more that 3/4 blocked. It took a further two years for any work to be carried out to clean them out. 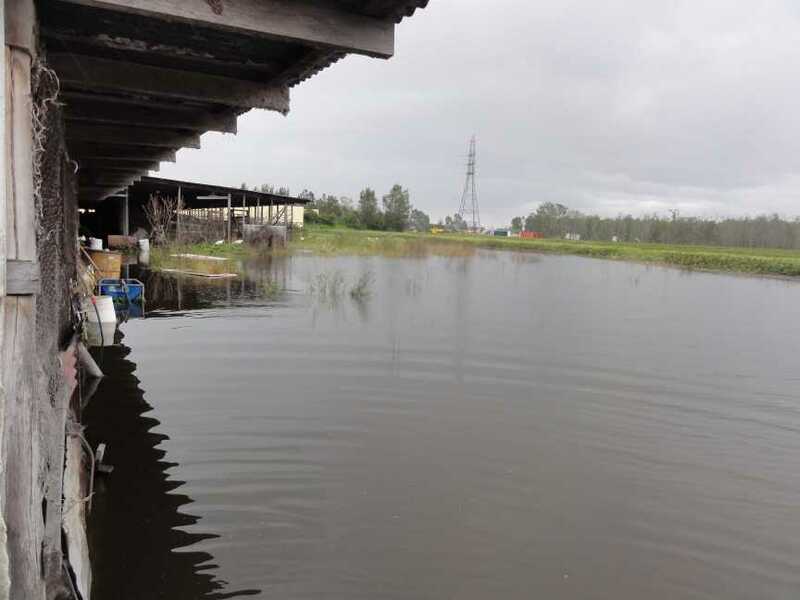 It is impossible to now see if the culverts are or could fully function during heavy rain because the water level is not changing with tidal influence as it should. Videos taken over the past 20 years will eventually be available on this web site in time, unless this issue is fully resolved. The time it has taken me over the past 18 months to attract the attention of those who can remedy this situation has greatly interfered with the use of my leisure time. I hope that they do not think that I will go away or that the web site will just disappear in the foreseeable future. For as long as I can afford to pay for the web hosting this drainage web site will remain as a living testament to those with their head in the sand or up you know where. 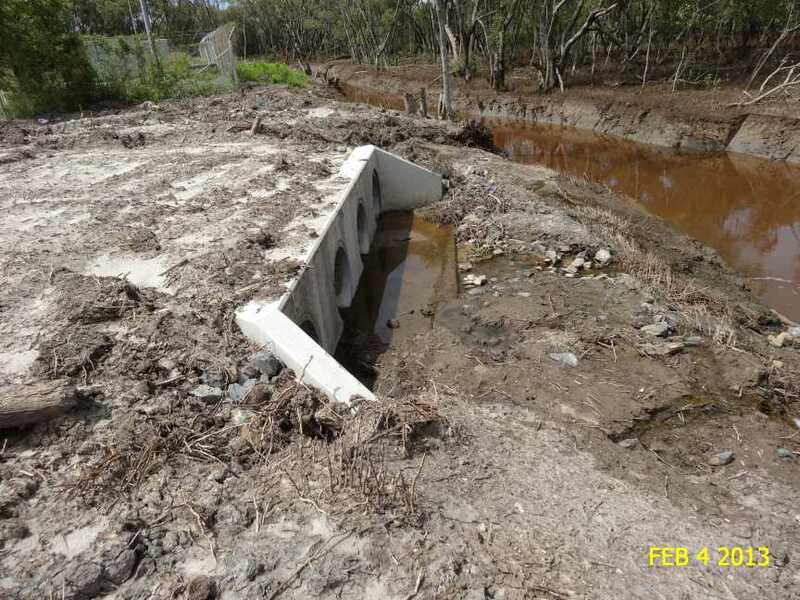 This photo of the Lytton Road Culverts at Channel 4 (2012) high and low tides cannot drain away. 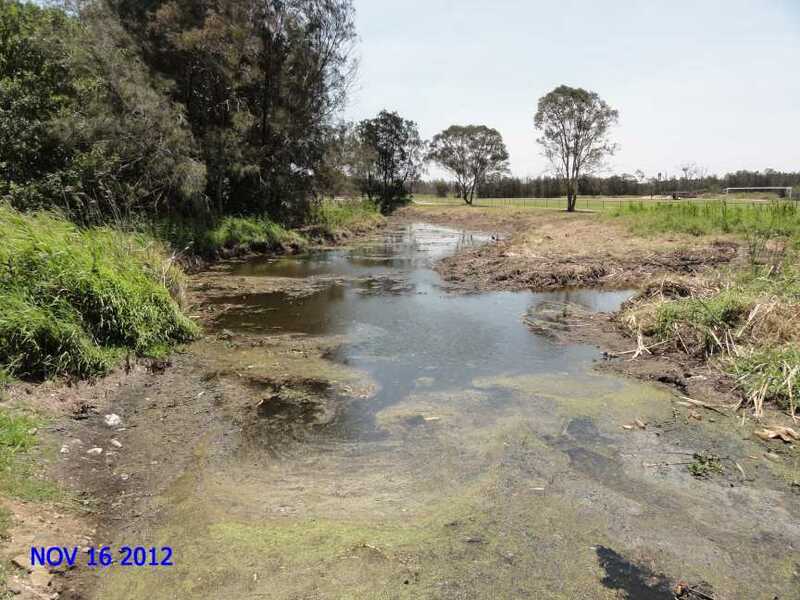 This photo (4 Jan 2012) was taken downstream of Lytton Road on Port West land showing just how blocked up this drainage channel is. 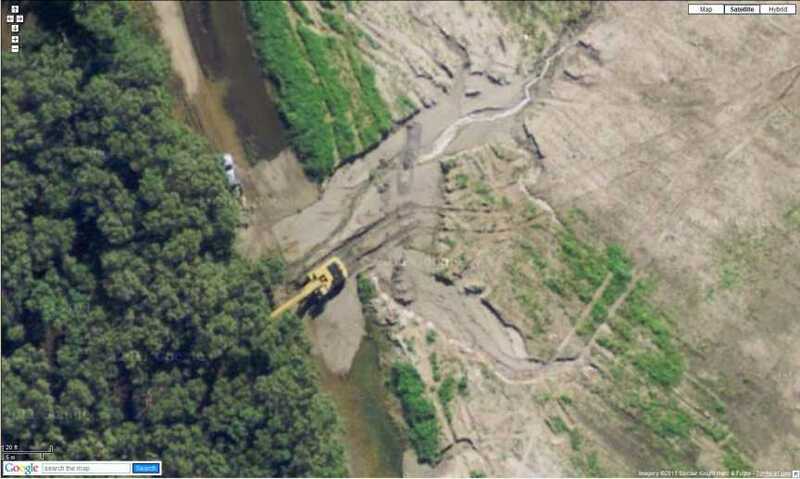 Just how wide was the drainage channel for the Lytton Industrial dredged? 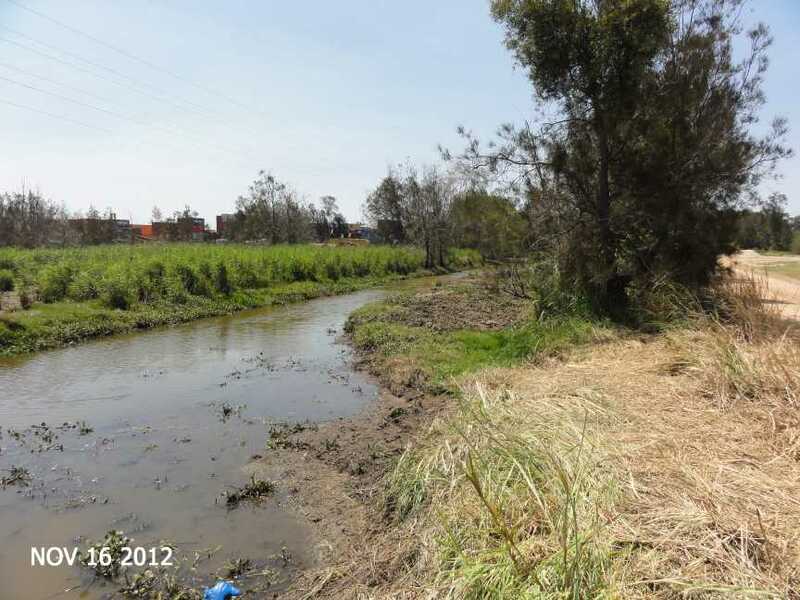 The photo below shows how wide the drainage channel was made to drain the Lytton Industrial Estate, a catchment far less that half the area than that of the drainage channel above. 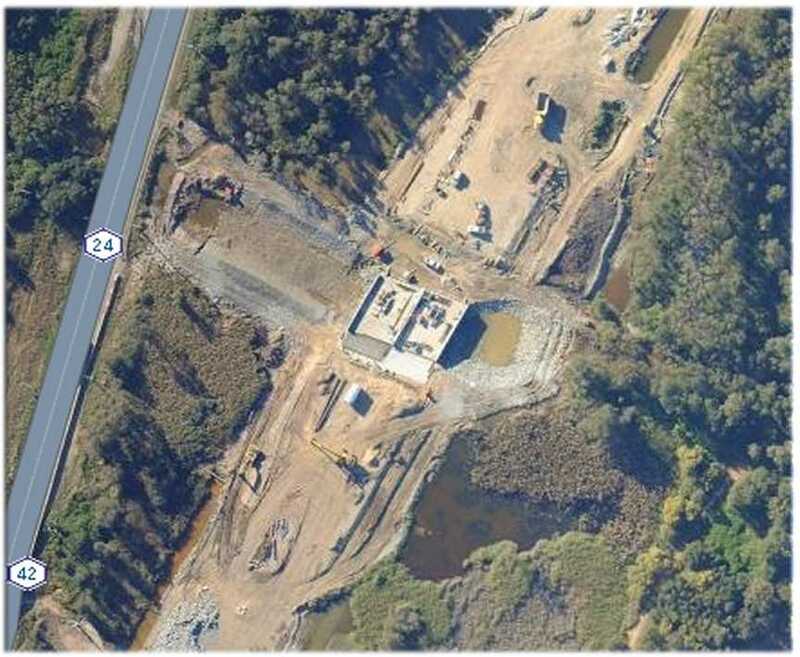 Not only did DBIRD clean out their drainage channel to the Brisbane River (as photo above) through Port of Brisbane Land but Port Connect installed drainage culverts under the new Port Road extension over 5 time greater flow capacity that that of the adjoining catchment to the south which is not only over twice the catchment area but has an overflow factor from Lindum Creek due to its poor drainage capacity under roads and mangrove encroachment along what what was a fresh water area whilst flood gates were in place prior to 1960s. 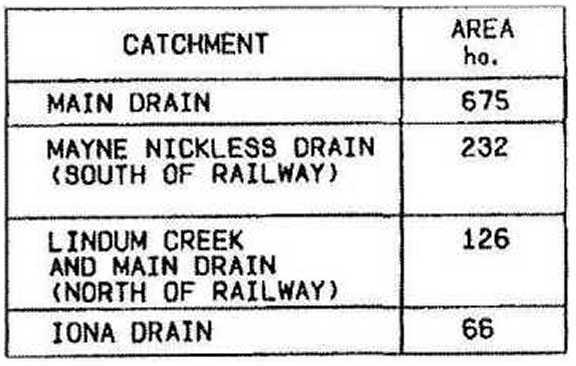 Just how wide was the drainage channel when built? 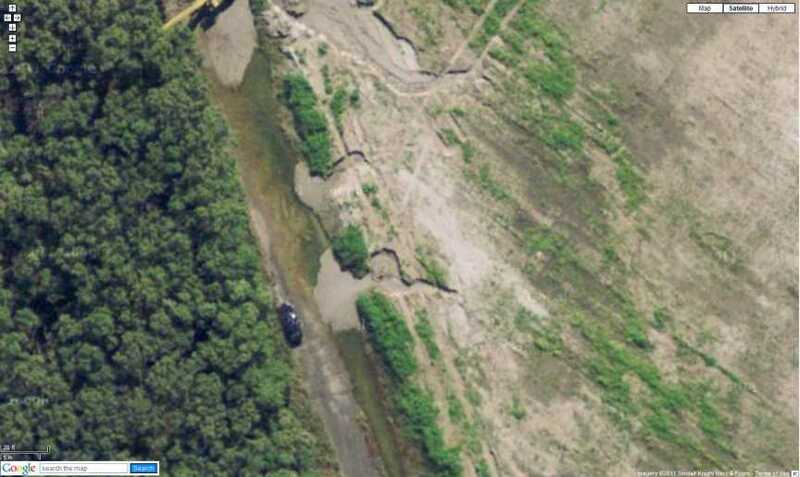 The next two photo were taken in 2012 at Channel 4's mouth with the Brisbane River wall. 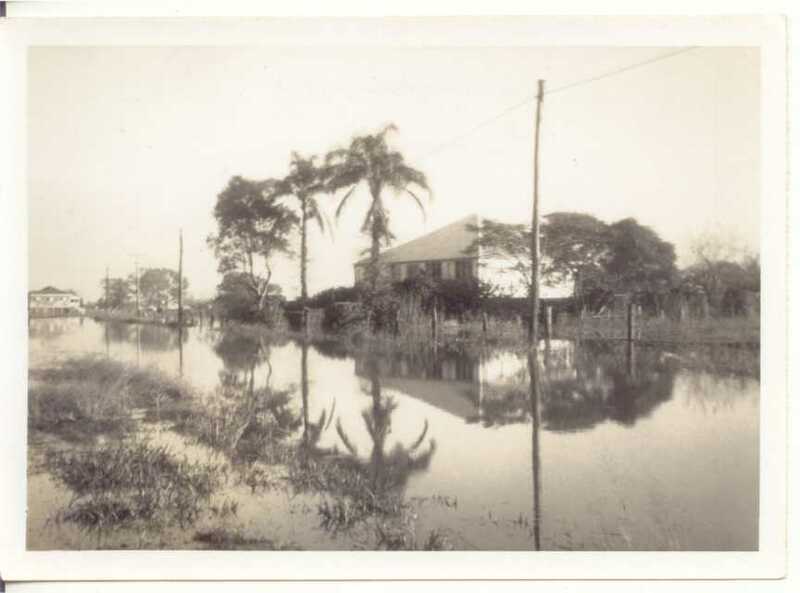 It is quite wide at this point and was quite a wide drain all through my early years right up to Lytton Road until Dept. 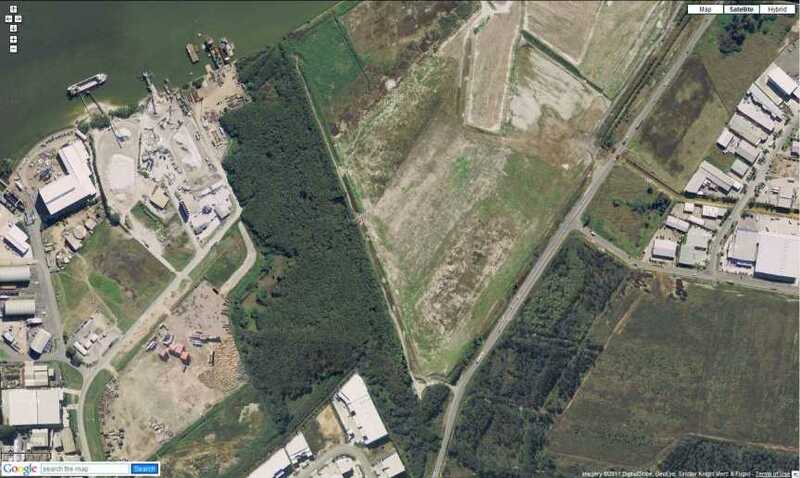 Harbour & Marine began to again pump dredge spoil on to the area adjacent now called Port West. Several local residents had their boats moored up this channel almost up to Lytton Road including a half cabin cruiser. The sand from the river was pumped behind the river walls for reclamation of land and the dredging of the river to allow larger ships to sail/steam etc. up the Brisbane River to now where SouthBank is now. 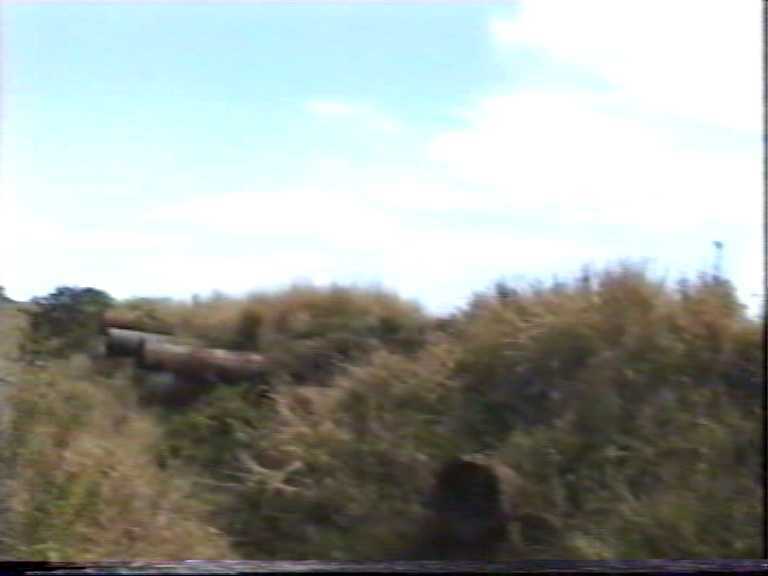 This photo taken from a video 1995 showing pipes through the bund wall which allowed dredge silt to flow into the drainage channel and silt it up over many years. 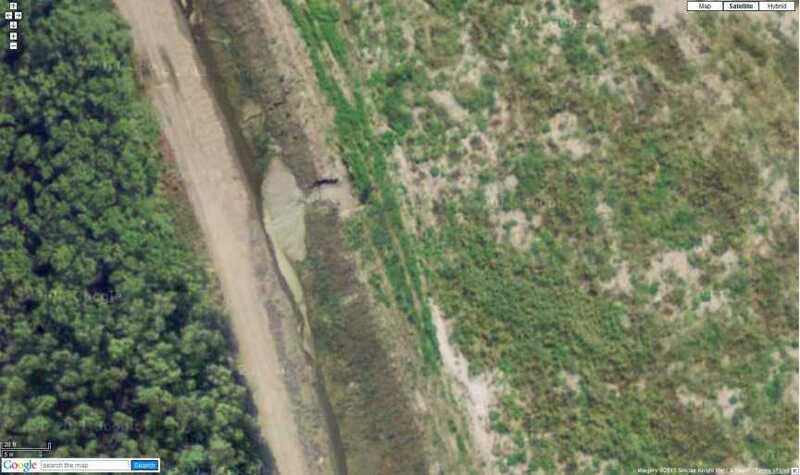 Image from Google earth of the Port West and and drain at Lytton. 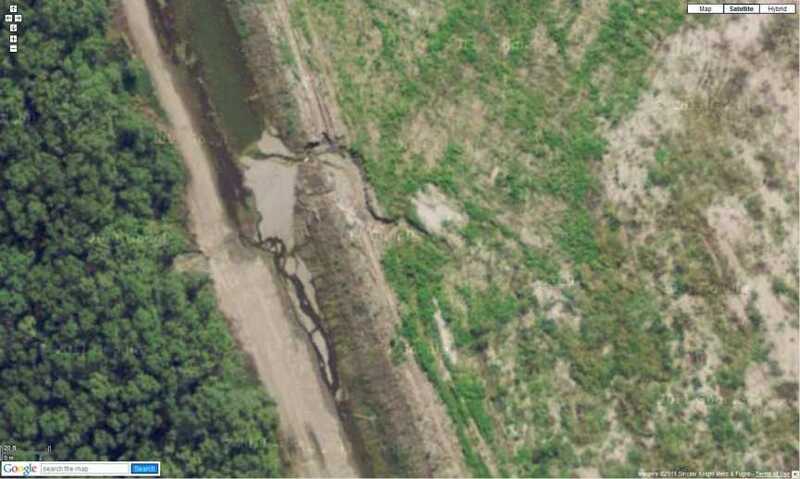 The following Google earth images zoomed in along the bund wall. 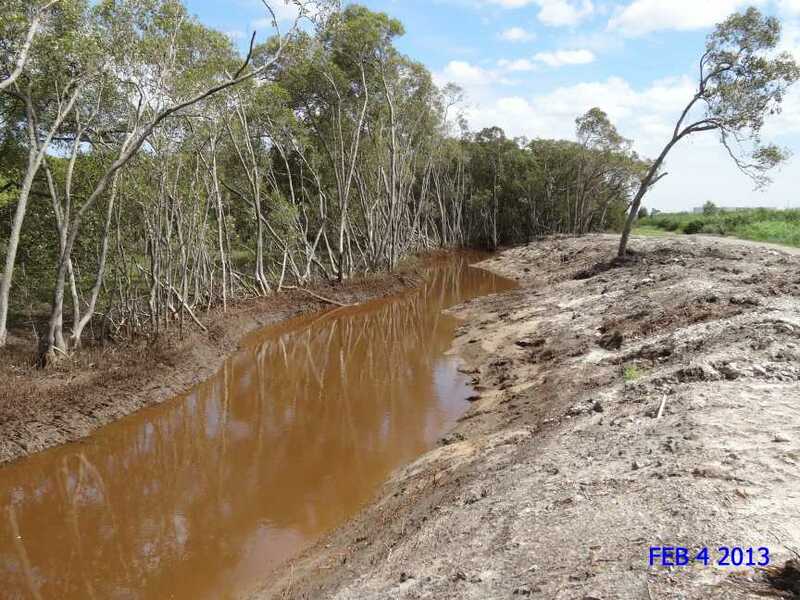 These breaches of the bund wall were never reported to the Environmental Protection Agency or Queensland Fisheries by the Port of Brisbane Corporation. 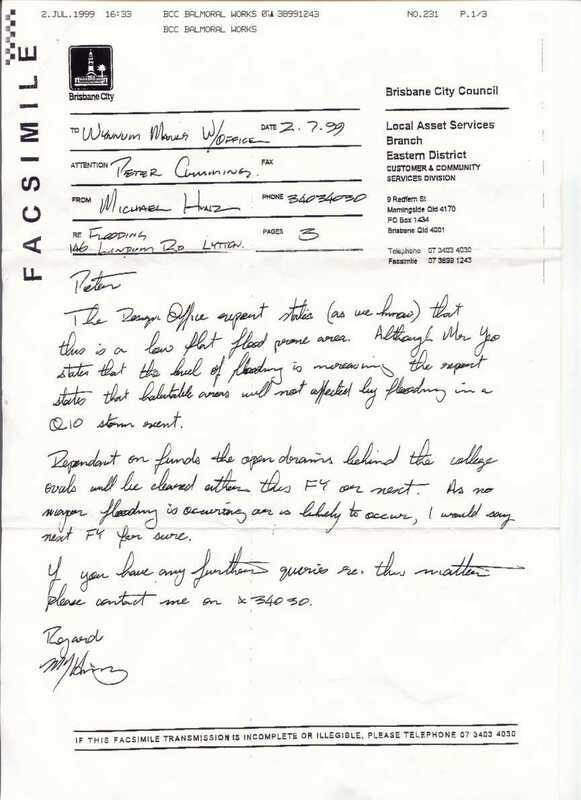 Take the time to read this letter. 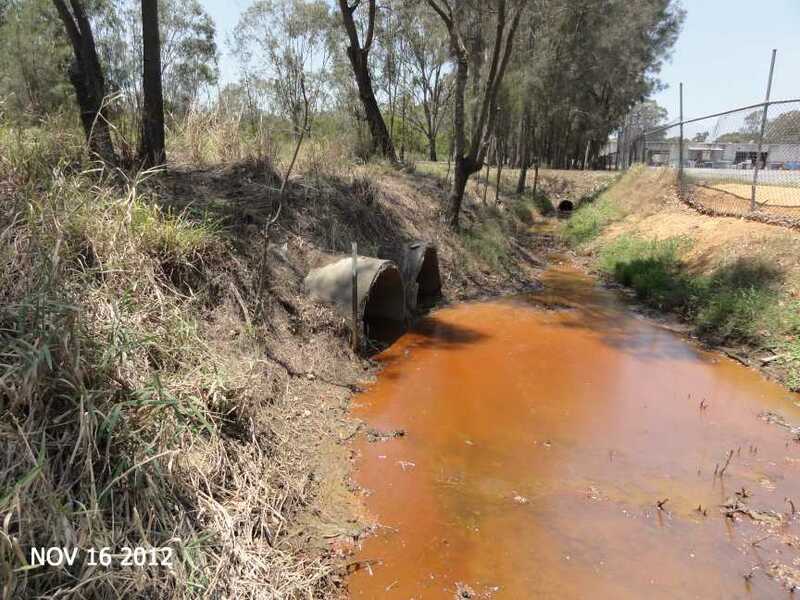 This environmental incident and another found upon inspection were never reported. 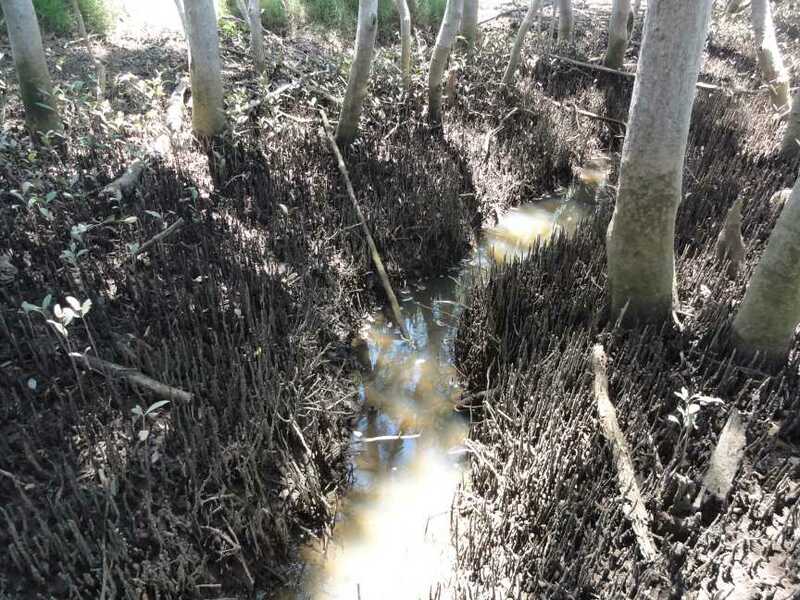 Photo of the drainage channel near this point, photo is below. 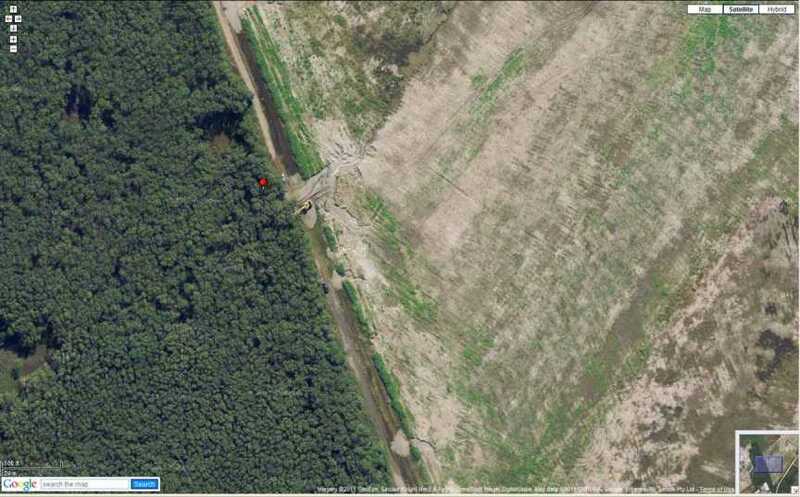 The photo below shows where the photo above was taken. Camera used has GPS location. 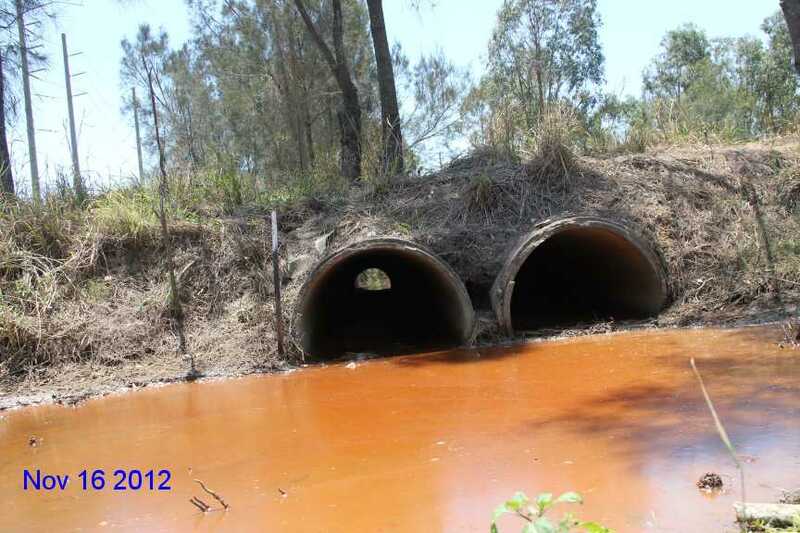 At a meeting with the Port of Brisbane Pty Ltd they denied any responsibility to clean out this drainage channel. 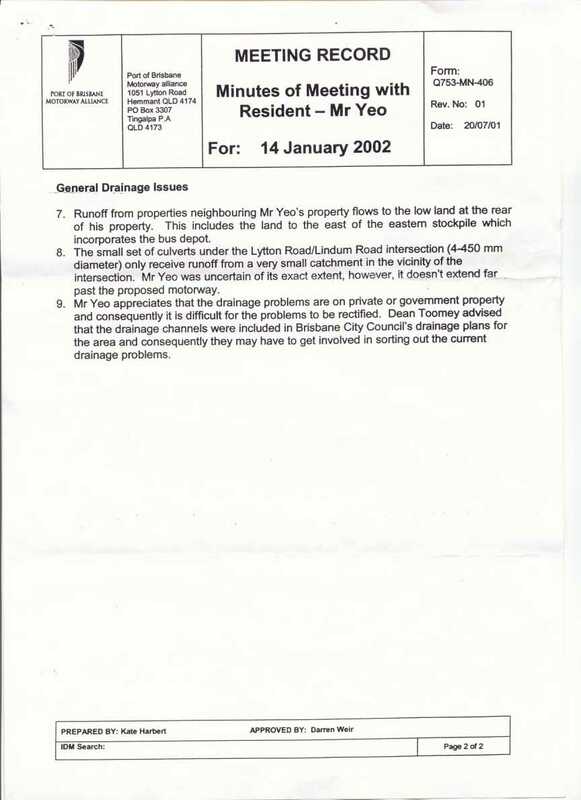 Then after I purchased a copy of the Lease they signed with Queensland Treasury and found that the Port was leased in "As is where is" condition and that the lessee was responsible for the drainage on Port Land. 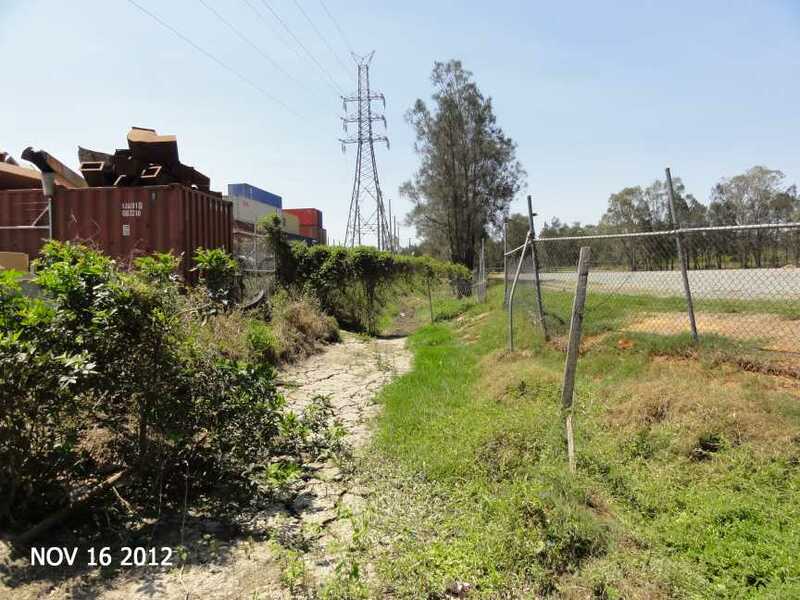 The Port of Brisbane Pty Ltd has agreed to clean out "some" of the Channel 4 drainage channel downstream of Lytton Road. Exact starting date and completion is unknown at this time. 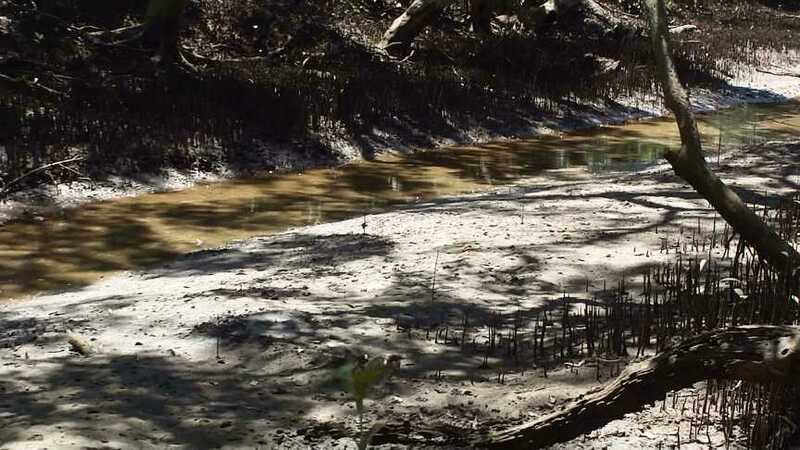 The Port is reluctant to expend enough money to clean out the entire channel to cope with the upstream development unless someone pays for it. Having this drain cleaned out even in a small way will hopefully assist land owners up stream in the duration of flooding. 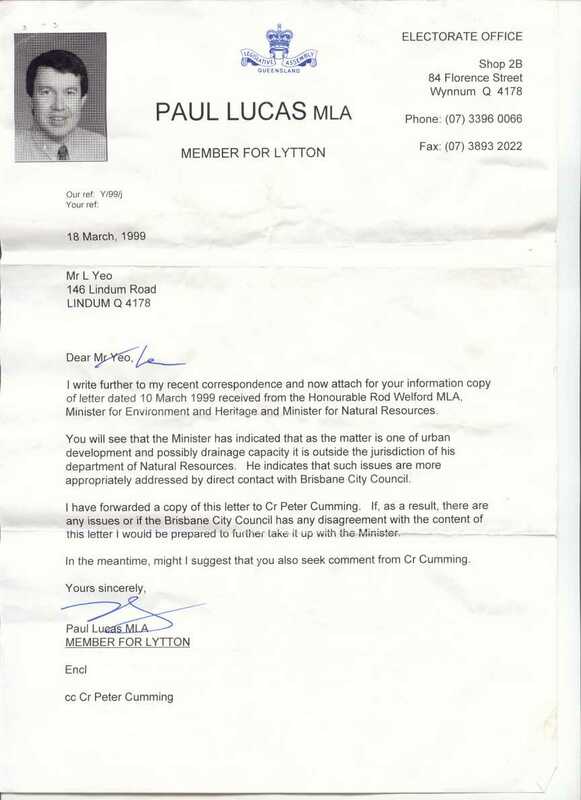 July 1992 Brisbane City Council. A major shortcoming of the Study was that no programme of community consultation was undertaken because of the nature and confidential status of possible alignment for a Port Road Corridor. This restricted both the development of an accurate social profile and, more seriously, forced the Study Team to develop a plan without any community input. ...."
Filling is taking place throughout the Lytton Road East development area. 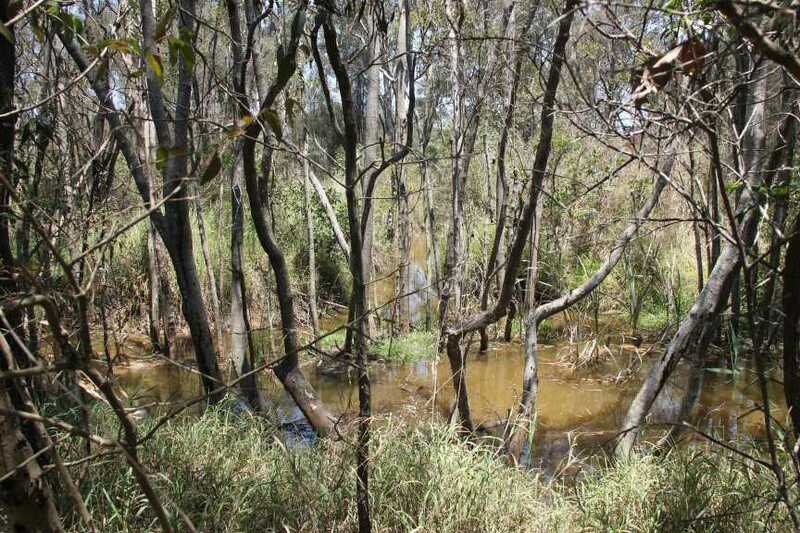 The amount of fill placed in what was a flood plain is incredible, some even without Brisbane City Council approval. 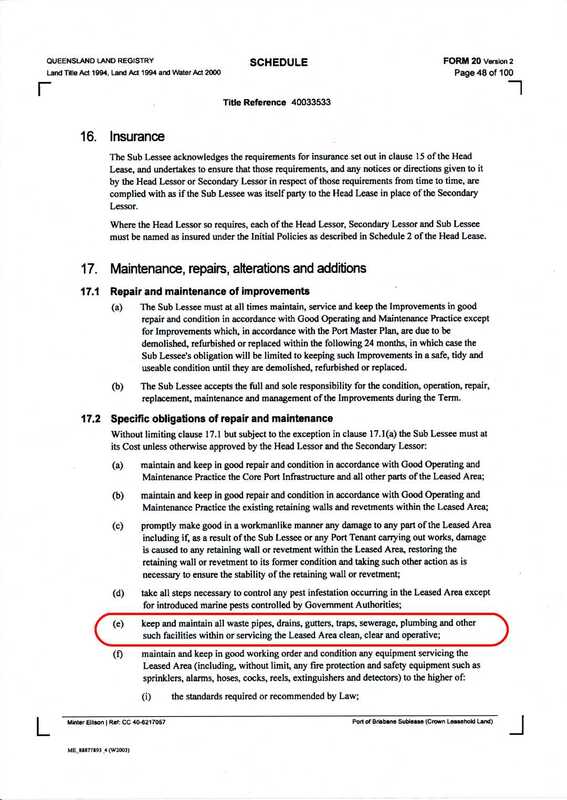 Many of the companies have undertaken drainage works within their properties but they abut other properties or roads where no further work has been carried out. Examples of this exist in Hemmant, such as Gosport Street near the Queensport Hotel and west of the Lytton Road and Lindum Road intersection. 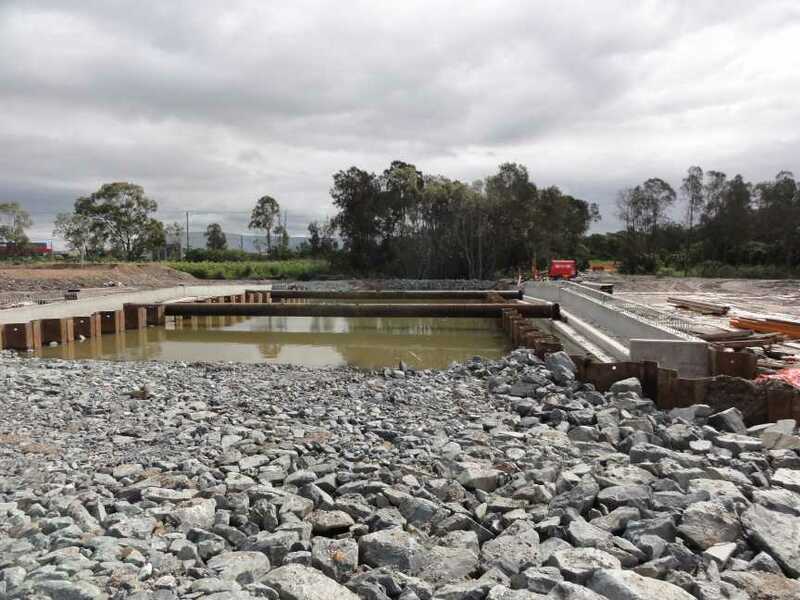 The dual gauge rail line to the Port placed more fill within the flood plain, yet no work was undertaken to increase the drainage to the Brisbane River or Bulimba Creek. 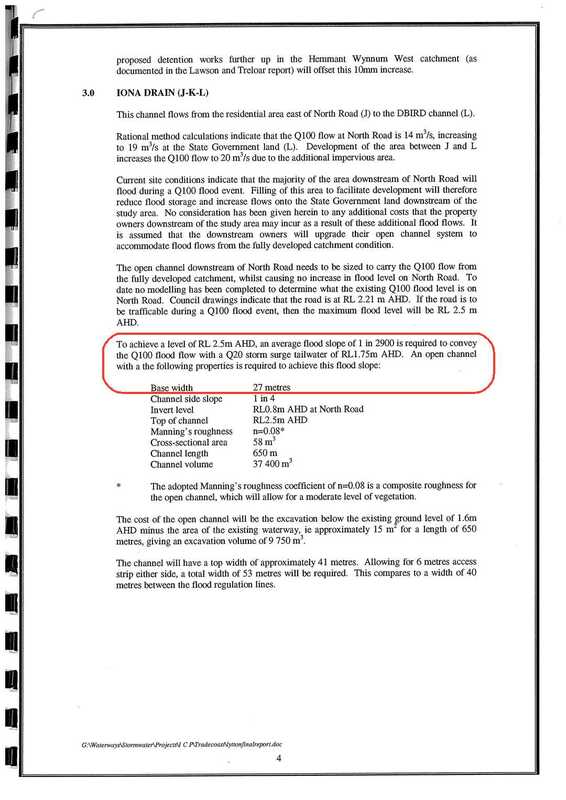 The Proposed Port Road will require a massive amount of fill to keep the road above the 100 year flood, and it intended to be built to 100 km/hr specifications, four lanes width. Invariably, inadequate drainage outlets will be provided beneath this road. 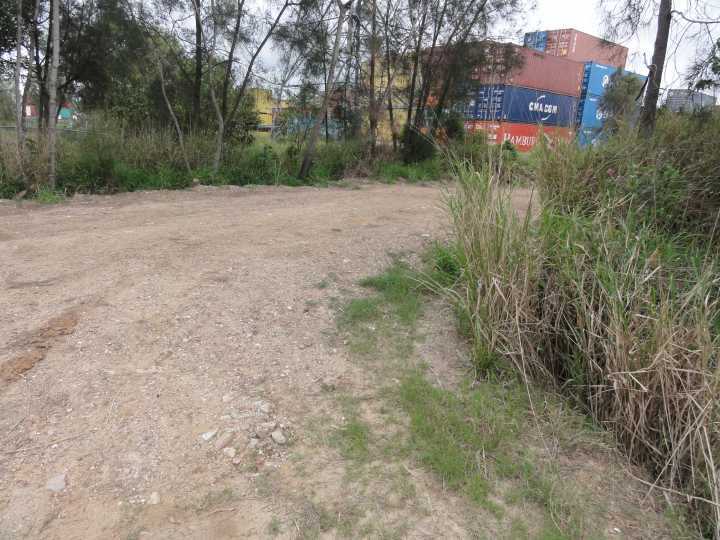 Even if large open sections are left beneath the Port Road, the Brisbane City Council has then to dig drainage channels to the riverfront, or creek edge. This is not happening at present. Unfortunately the site where this photo was taken was not reported correctly. 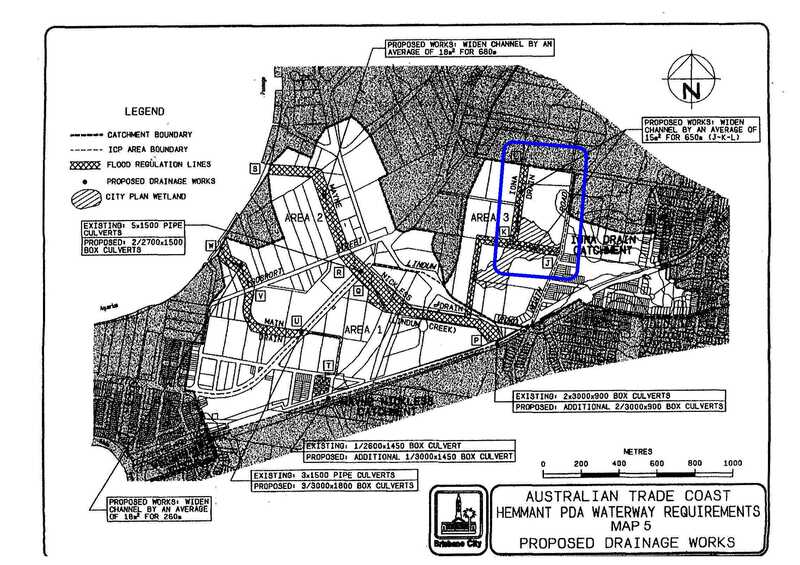 The culverts shown above are some 800 metres north along Lytton Road, Lytton out bound of Lindum Road near Port West the site what is now know as Channel 4..
What is also missing in this diagram is the information that Lindum Creek, when in flood, passes under through a solitary pipe in front of 102 Lindum Road then flows over Lindum Road in an attempt to reach the Brisbane River by flowing out through Iona Drain. 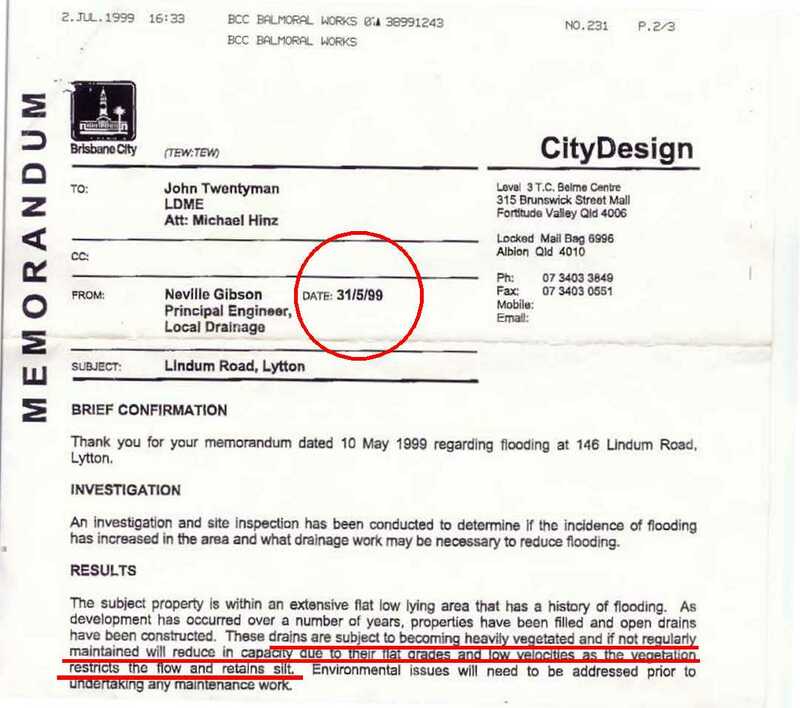 This information is also missing in the Brisbane City Council Flood Studies of Lindum Creek, Bulimba Creek and Hemmant Creek. 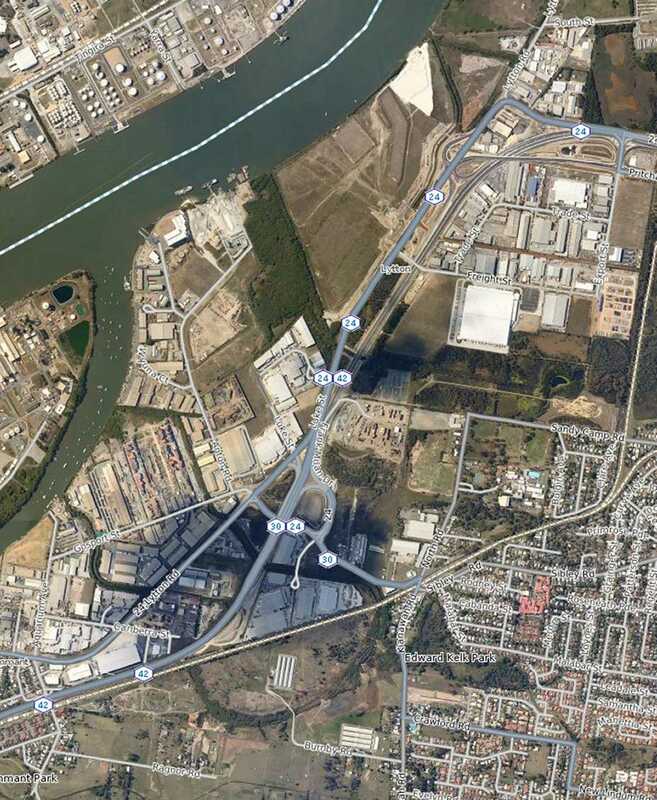 When you look at this Lytton flood mapping take note of how well the Industrial Estate at Lytton is drained to the Brisbane River compared to the land to the south.